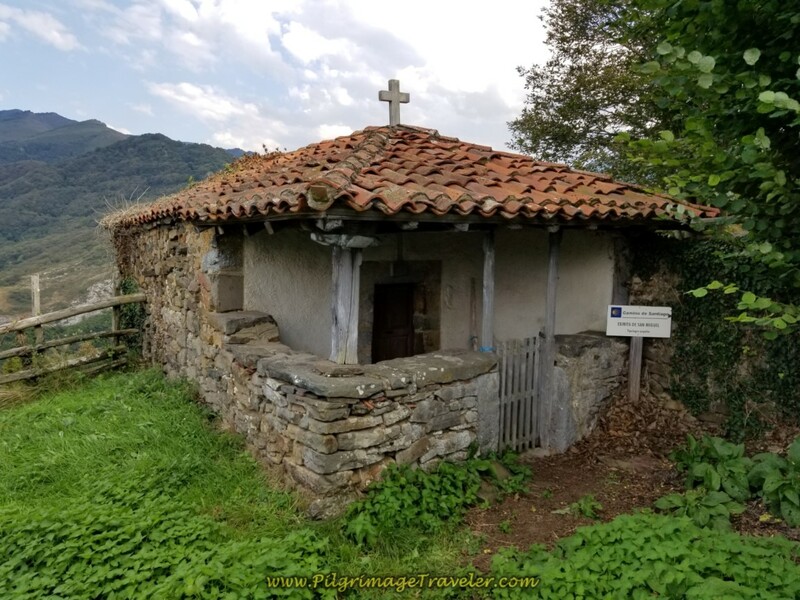 By the end of day two on the Camino de San Salvador, the Way takes the pilgrimage traveler into the heart of the Cantabrian mountains, leaving civilization behind. 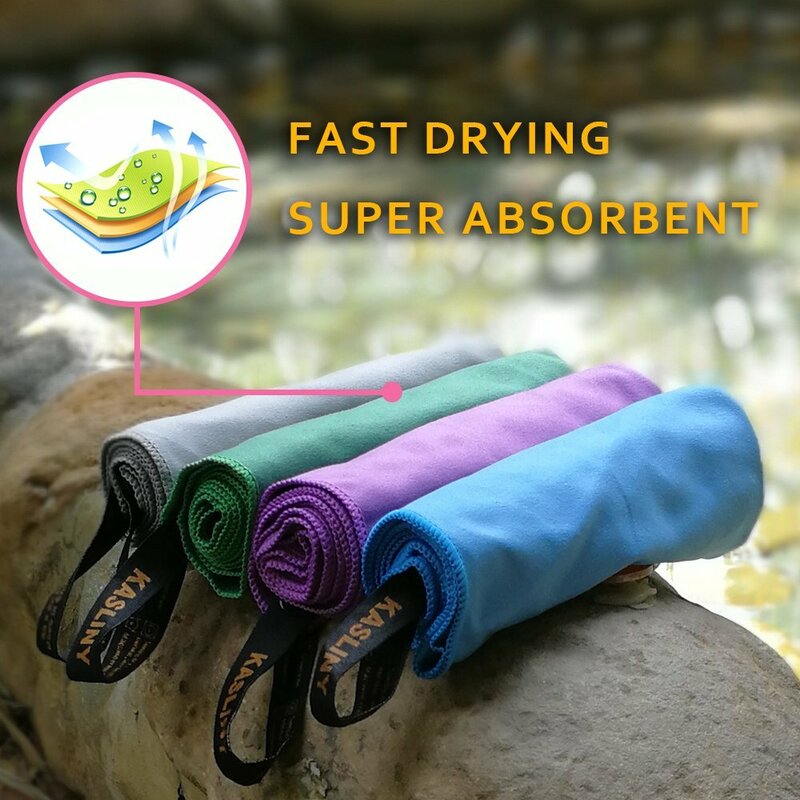 The scenery and the difficulty that you have been waiting for, finally arrives! Here is our Google map of the day, created from our uploaded GPS tracks. I have included the services on the map, so you can plan your day. 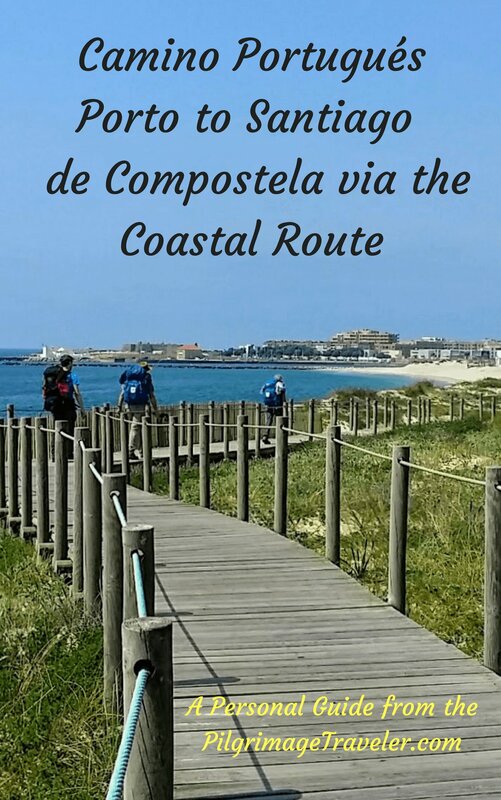 There are not a lot of services along this route, so planning is a must! 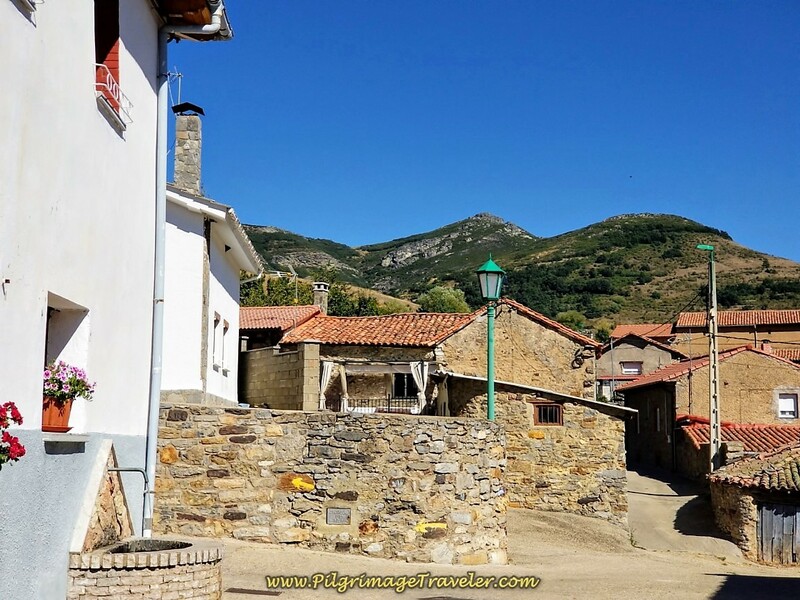 If you are stopping at the albergue in Buiza for the night, you must get your food to cook in La Pola de Gordón. There is one small café in Buiza for the locals, noted on the map, however the hours it is open are erratic. 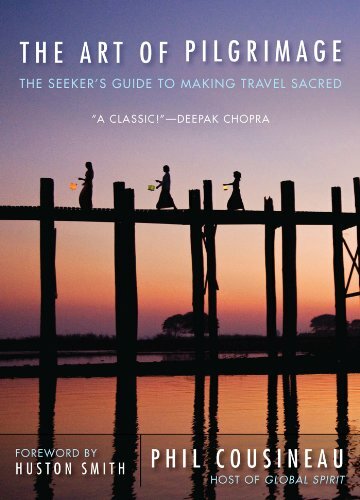 The same is true if you plan to make it all the way to Poladura de la Tercia. 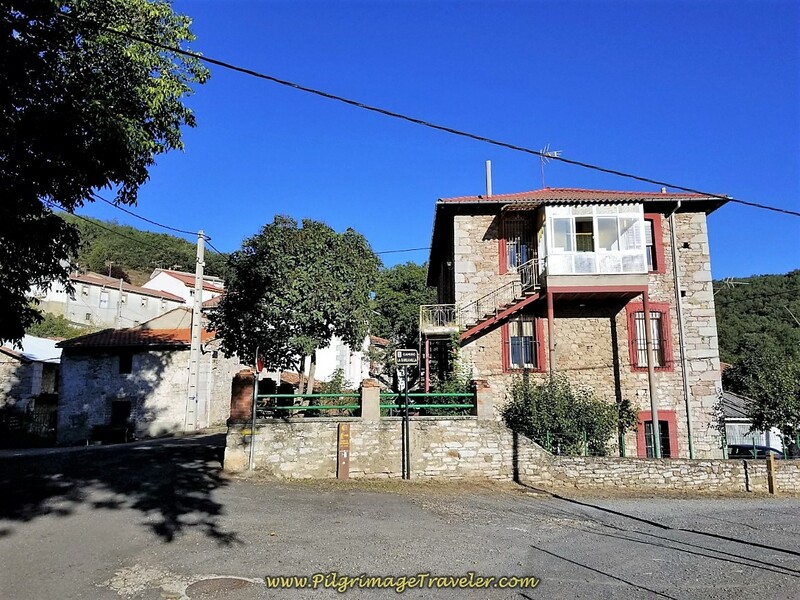 You will either need to get your food for the albergue in La Pola de Gordón, or call ahead for a meal at the only place for food, the Posada de Embruja, next to the albergue. 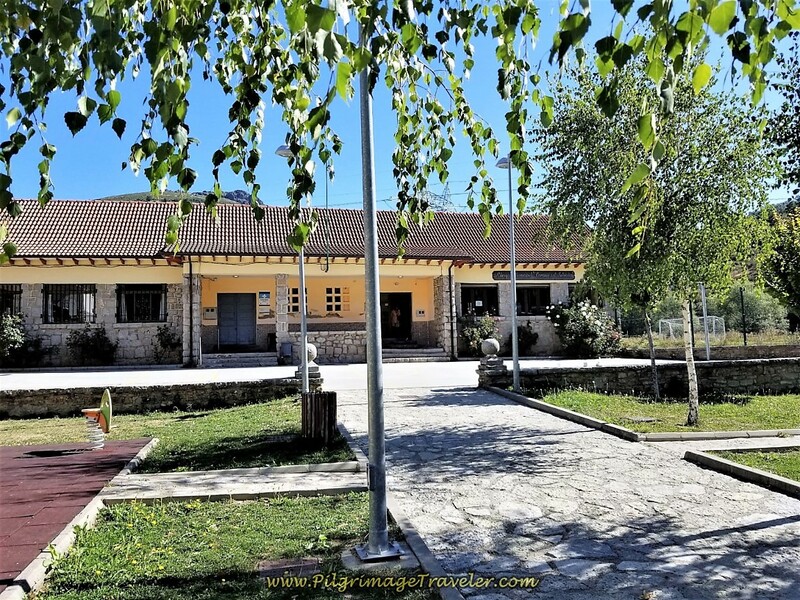 This restaurant is within the Casa Rural, right next to the albergue. Be advised that dinner here costs 15 euros per person! Breakfast is an additional 3 euros, for a total of 18 euros per person. 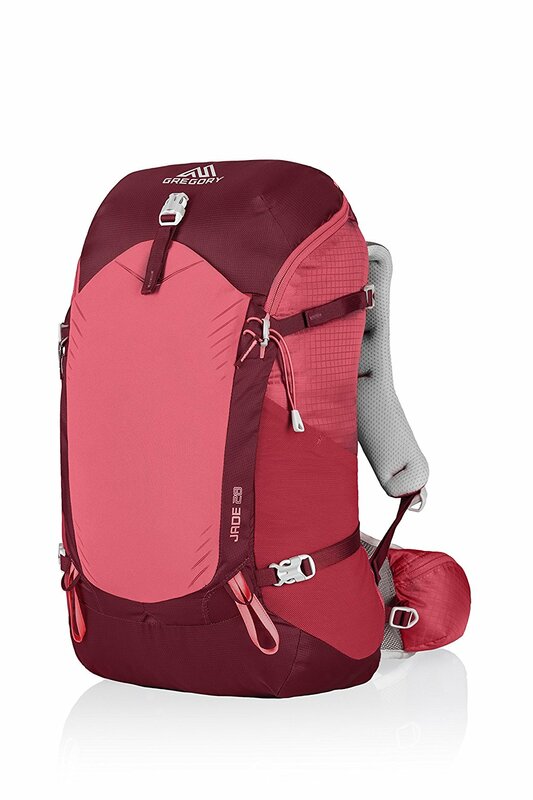 Be prepared to eat from your pack, regardless. 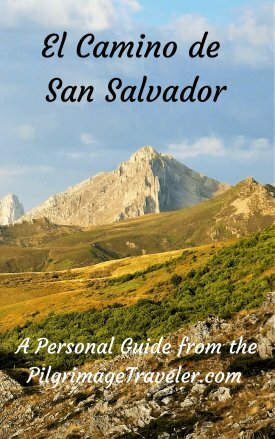 This is the Camino de San Salvador, and you never know! We had actually made a reservation for the night and for dinner, the day before, so they did know we were coming. 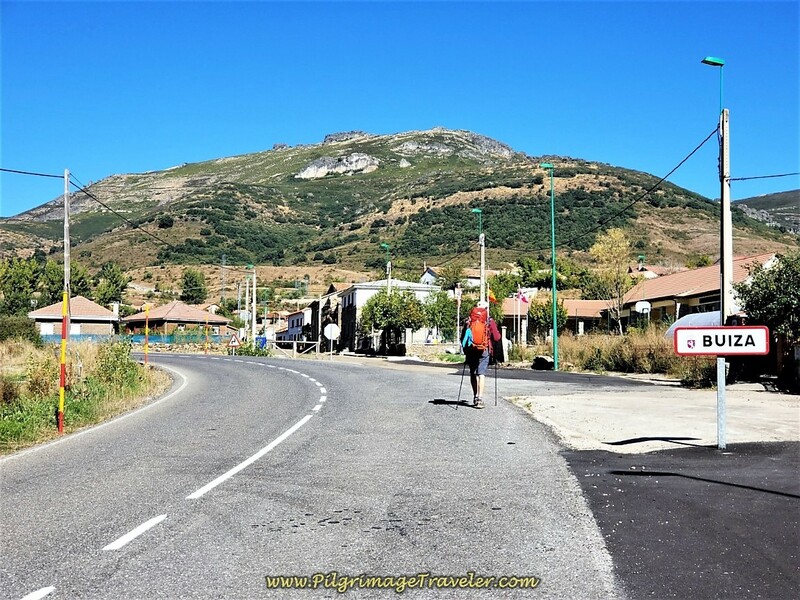 Important note:The grocery store in La Pola de Gordón is the last one all the way through to Campomanes, so you will have to carry two days worth of food if your plan is to cook in the Poladura de la Tercia and Pajares albergues! 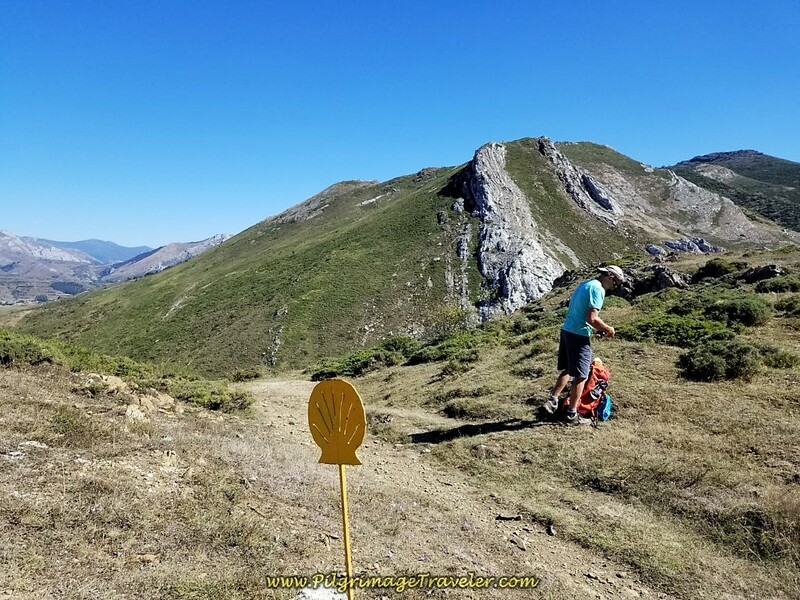 The day essentially consists of one long climb to the high point called Las Forcadas de San Antón at 1463 meters in altitude. 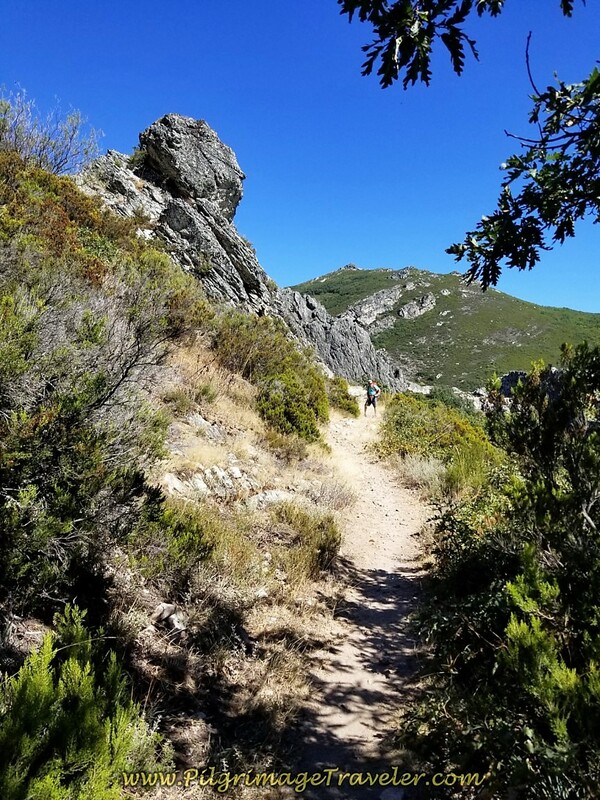 The climb is unnoticeable until the final three kilometers or so, when the steepness quickly increases as you climb up and out of Buiza. All told it is about a 500 meter climb (1600 feet). It is a day filled with glorious views, that will reward your efforts! I do not have the final 800 meters included in the above profile, but it is essentially flat. I turned off my GPS when I incorrectly thought that we had made a wrong turn, just before Poladura. See our trip details below. 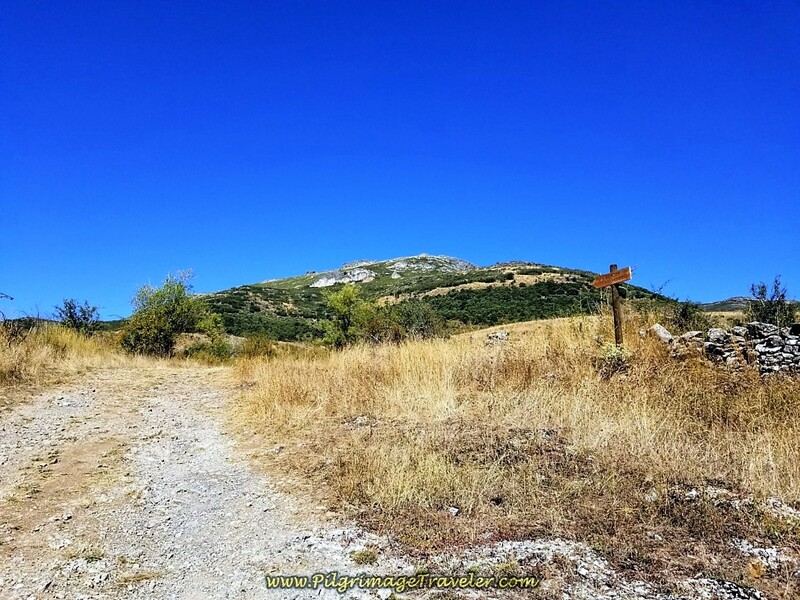 Side note: Many pilgrim's GPS tracks that I have studied since returning from this walk, show a shortcut that runs across the fields just before the cemetary on the outskirts of San Martín de la Tercia (at the end of this stage), avoiding the town altogether. 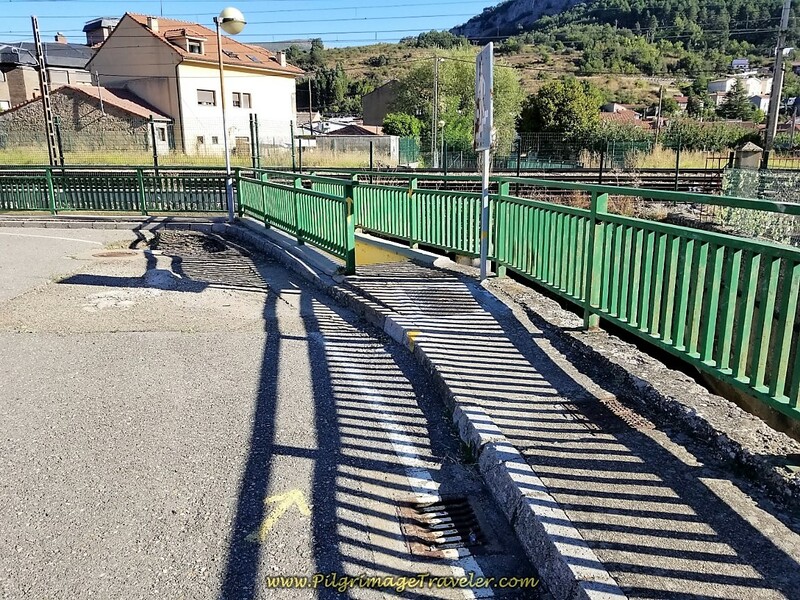 After studying my own photos, and the wooden waymarks in them, (I GPS tag my photos and upload them to Google maps, to ensure my location info is accurate), I am convinced that the Camino now goes through the town, and I did not miss this shortcut. 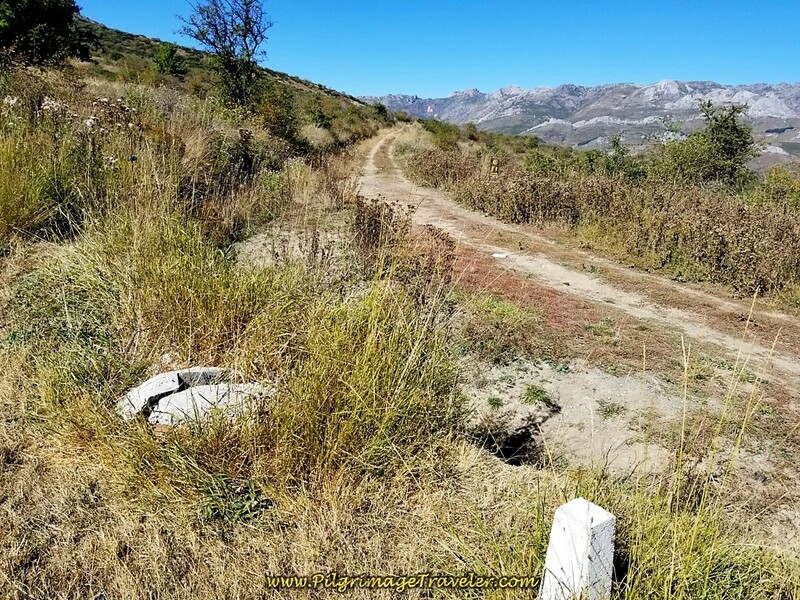 Be aware that perhaps the locals no longer wish for peregrinos to walk through their land, so please respect the posted waymarks and stay on the road to San Martín. 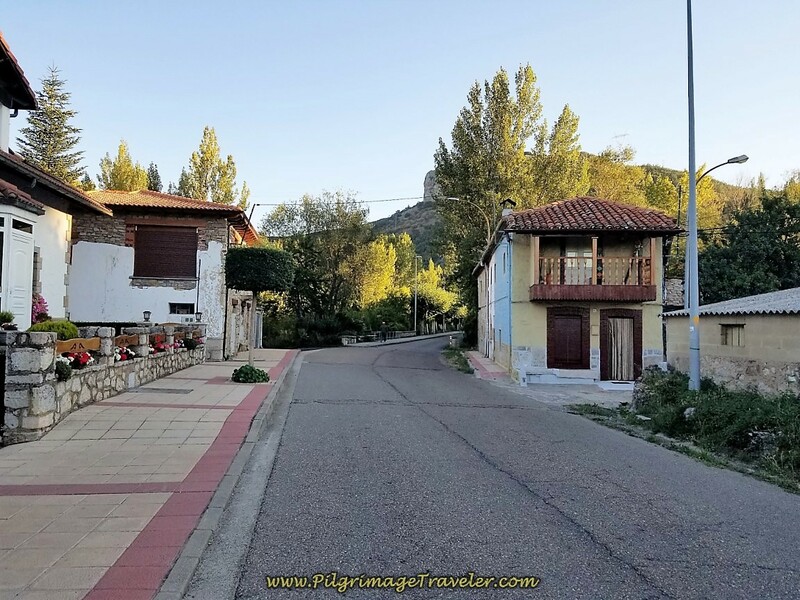 Our day started out just after dawn, on a cool and very crisp September morning, walking northward on the main road of La Robla, the Calle Mayor. There is a nice sidewalk here, so you will be safe as you walk along. 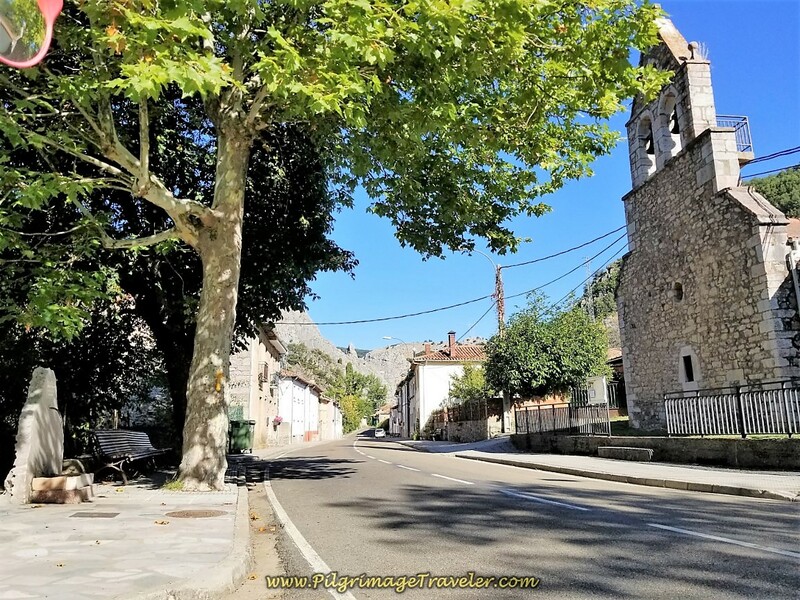 Within 400 meters of leaving the albergue, pass by the Café Bar Jordi Parrillas which doesn't open until 10:00, so unless you are leaving late, plan on cooking your own breakfast in the albergue. 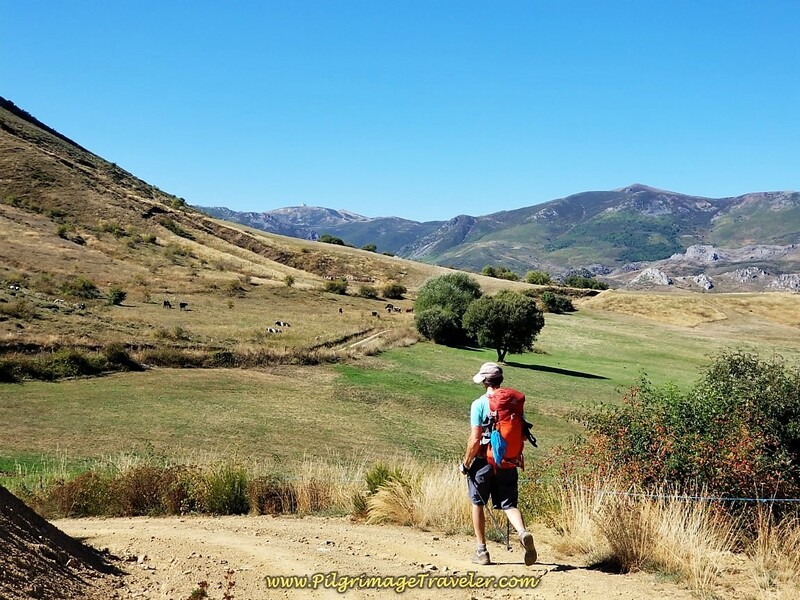 The Camino quickly joins the Río Bernesga once again as it walks you northward. The railroad, also follows the path of the river and accompanies you on the right, in an elevated road bed, through this section. In about 900 meters, you come to this aqueduct, shown below, built in 1795 and more recently restored. There is a nice plaque describing how a famous 19th century Spaniard politician wrote about this particular place in his diary. 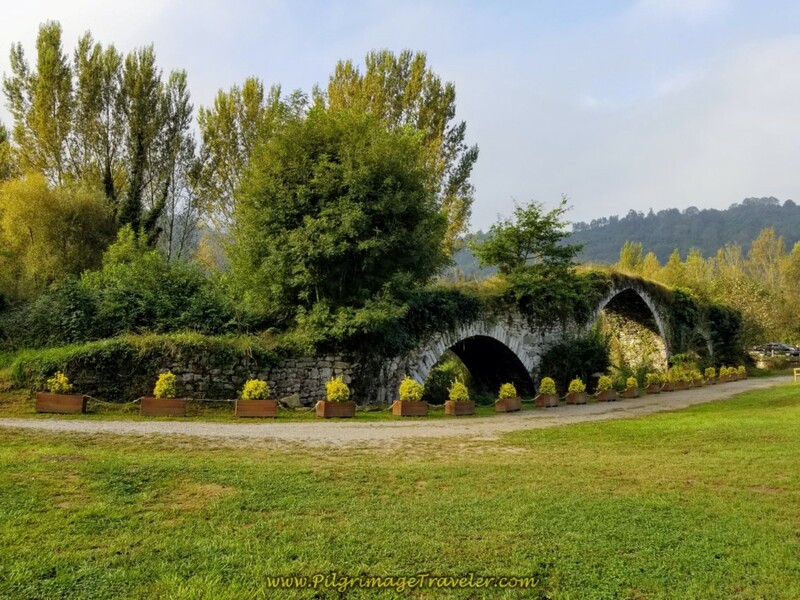 In only 300 meters more along the river, at 1.23 kilometers, an historic bridge greets you, called the Puente de Alba. This bridge is part of a local castle. Here I am, posing in front of it. 350 meters onward, after the bridge, the road joins the N-630, shown below. 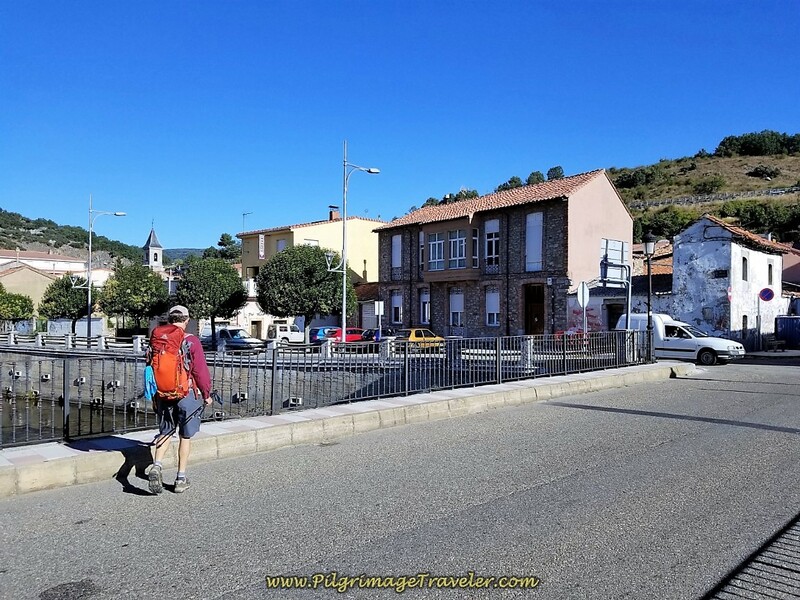 Next, walk through the town of Puente de Alba. There is a fountain in town, if you need to fill your water bottles. There is a nice parallel roadway through this section on the busy N-630 the national highway. 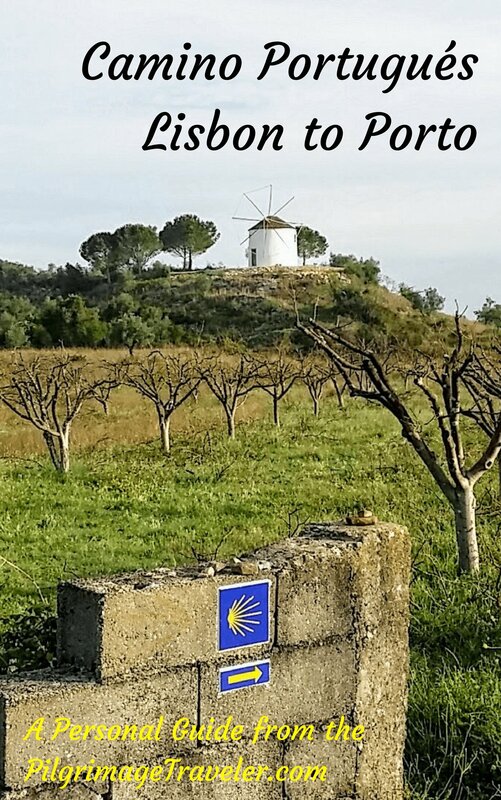 After 350 short meters on the national highway, the Camino de San Salvador takes a right turn up a hill, and onto the Calle Real at this waymark. 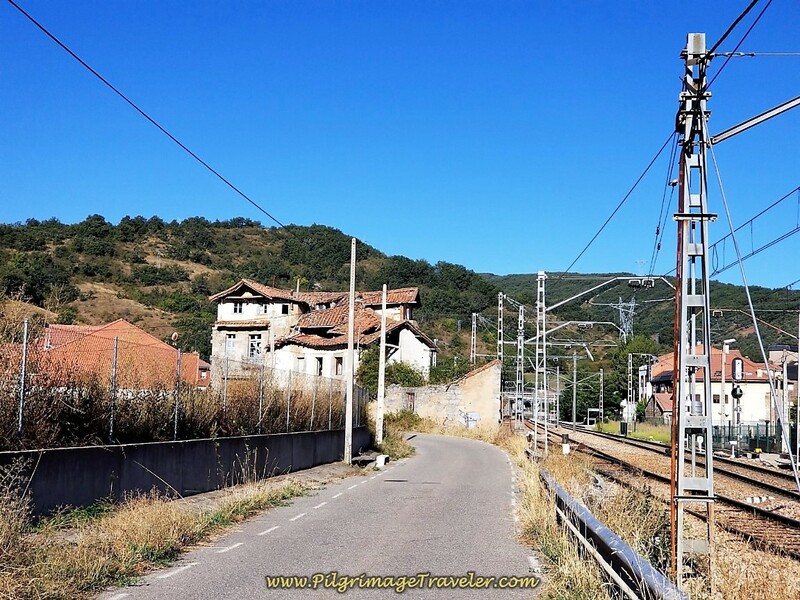 Immediately the road takes a bend to the right and crosses over the same railroad that the Camino has been following for a time. 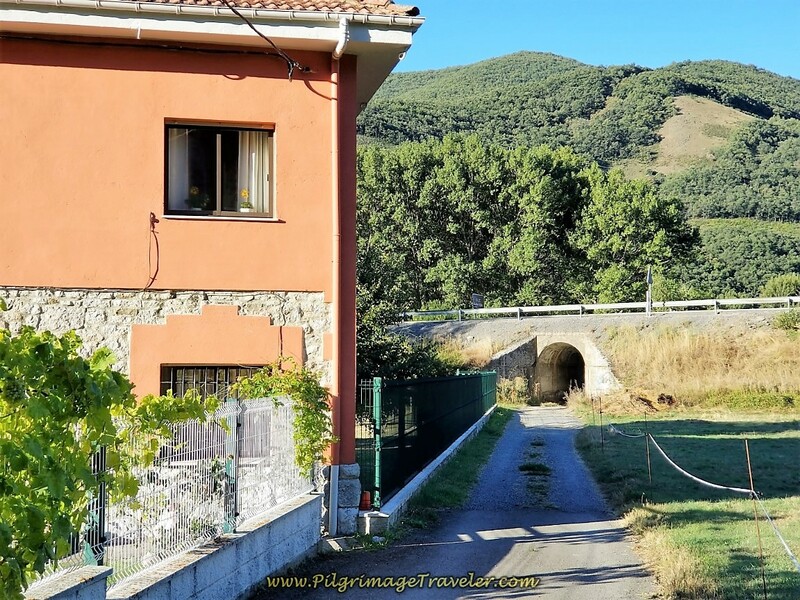 This quiet tree-lined road takes you into the next village of Peredilla. There are no services here in this small town. 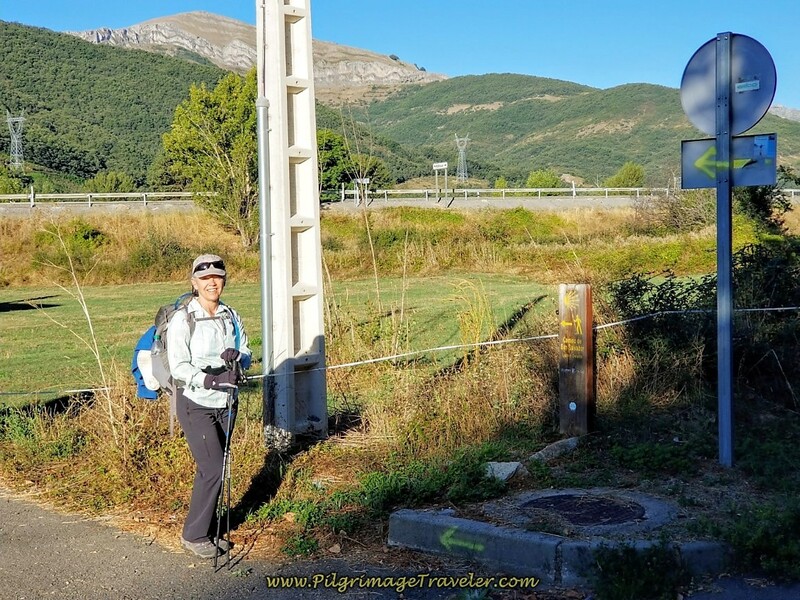 At about 3.4 kilometers into day two on the Camino San Salvador, after walking through Peredilla, the Camino leaves the pavement, taking a left hand turn, shown in the photo below. This dirt tractor lane heads for a tunnel that passes under the N-630 and joins the railroad. The tractor lane follows the railroads tracks for 850 meters. At 4.28 kilometers, there was a clearing ahead, with the sunlight brightly lighting up a steeple. It was the Ermita de Buen Suceso, and it was inviting in the brilliant morning light. There are picnic tables here, if you find yourself in need of a break when you arrive. Little is known about the origin of the hermitage, which is has been cited in documents as early as the tenth century. 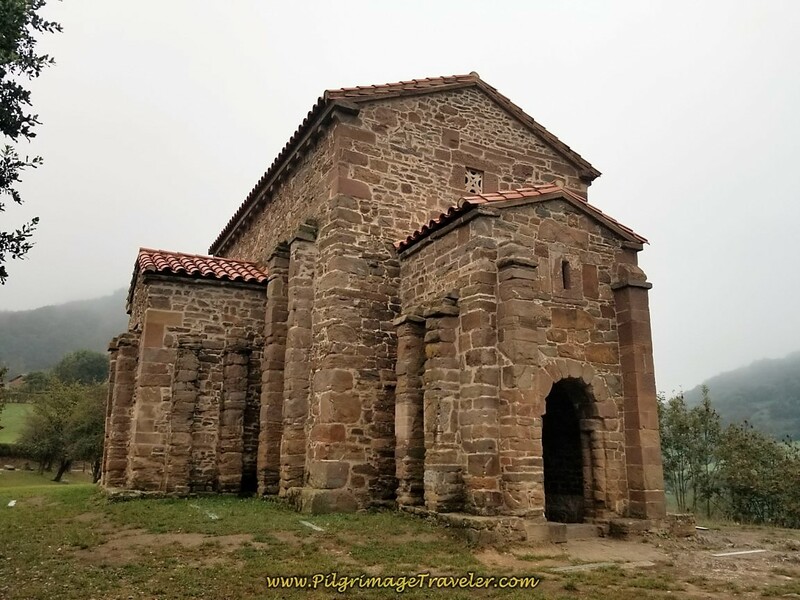 The existence of numerous Jacobean shells in its decoration, link the temple with the Camino de San Salvador. According to an inscription on the keystone, this particular building was first build in 1766. 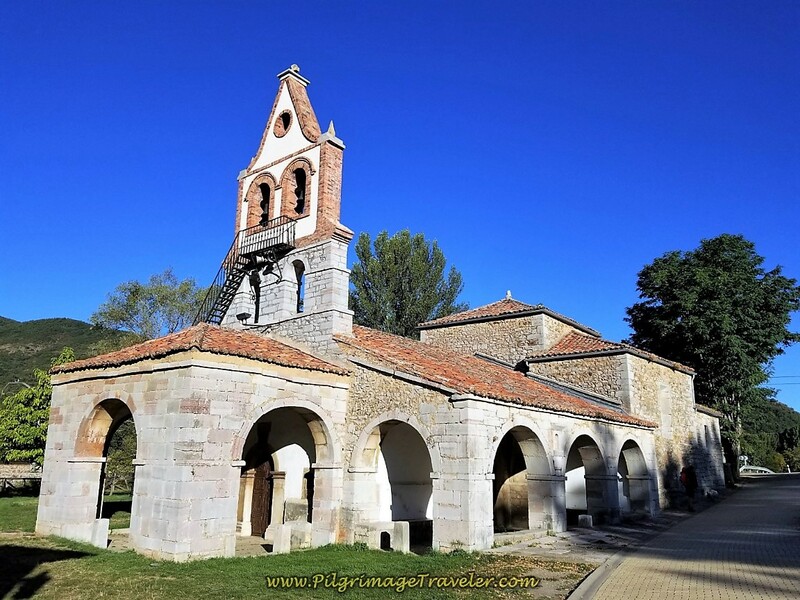 The image of "Our Lady of Good Success" represents the Immaculate Virgen and has a large number of devotees throughout the region, who celebrate a great pilgrimage on the first Sunday of September, with a large local festival. It would be interesting to stumble upon if you land here at that time! 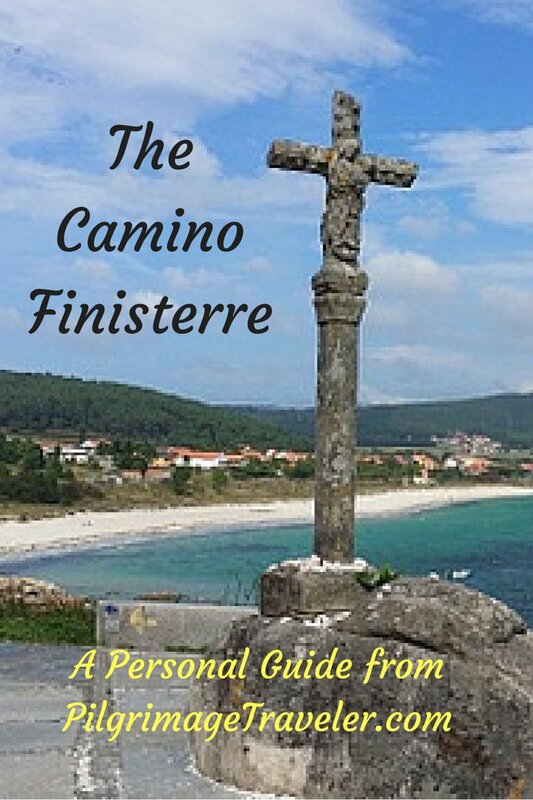 It is at the Ermita where the Camino joins the N-630 once again, but only briefly. There is a restaurant here, the Restaurante Buen Suceso, across the street from the hermitage, that according to its website opens at 7:00 in the morning, however, when we walked by much later, it looked deserted. There is another fountain, also, beside the Ermita, right along the highway. 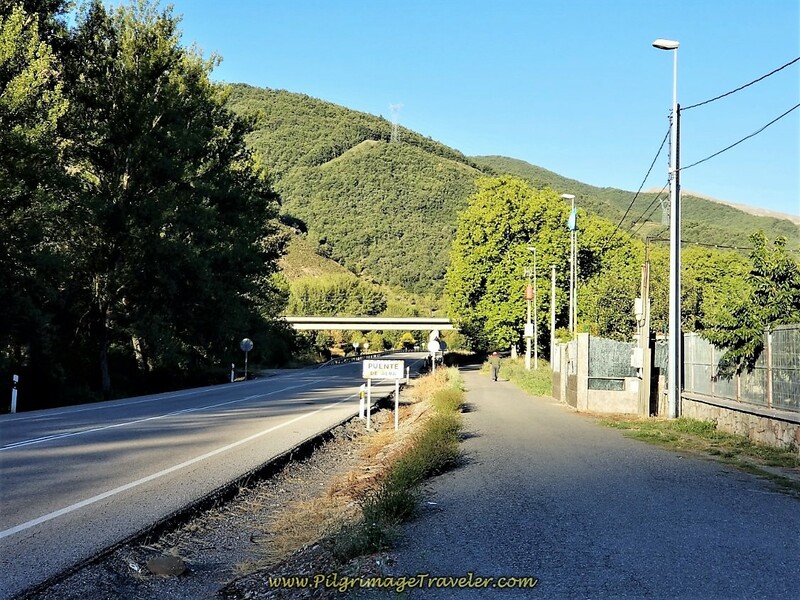 Very shortly after the fountain, the Camino takes a left turn onto a side road, shown in the photo below, and towards the next town of Nocedo de Gordón. You do not walk into Nocedo de Gordón but turn right at this building, below, after only 400 meters from the turn. 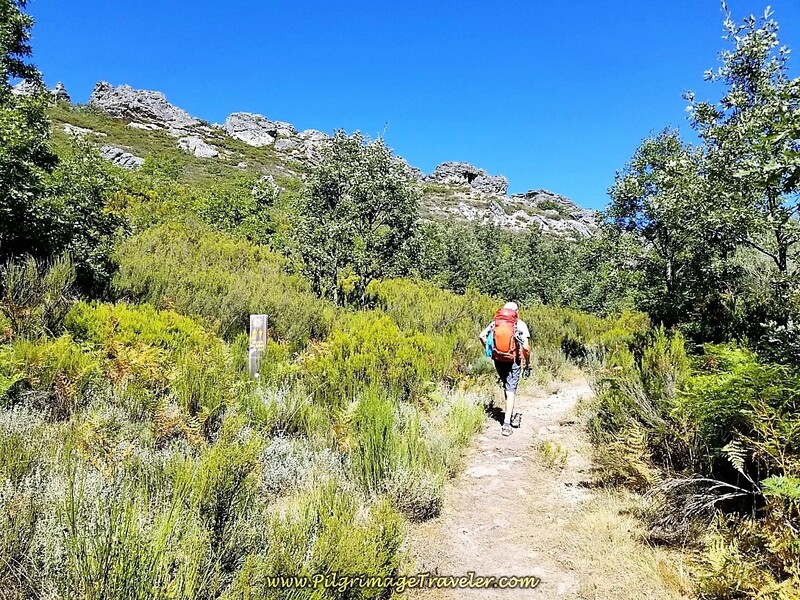 Thus begins an off-pavement trail system for approximately two kilometers. You are continuing to follow the path of the River Bernesga, now on your right. 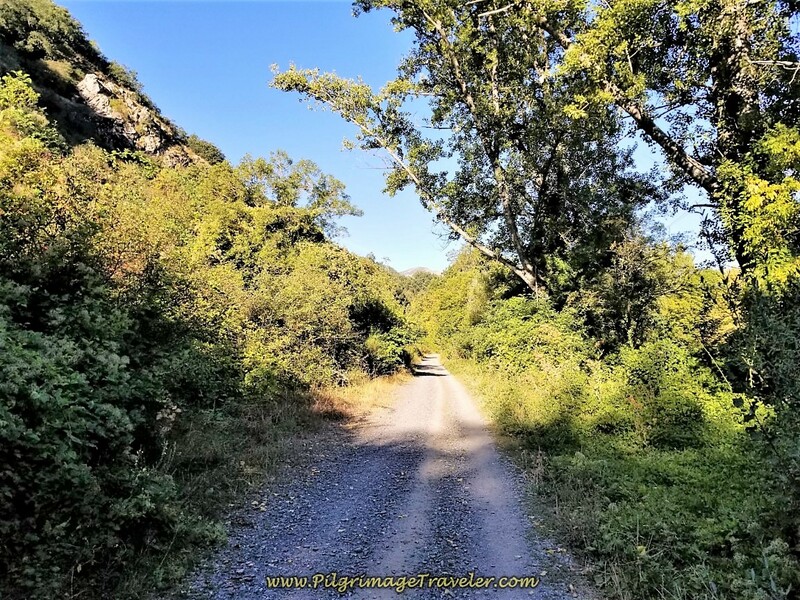 This river valley road is a nice and easy gravel road. Enjoy the flat walk while you can! 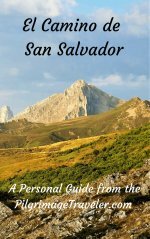 They are few and far between on the San Salvador! First cross under this overpass, shown below, then follow the road into shady woods running along the river. 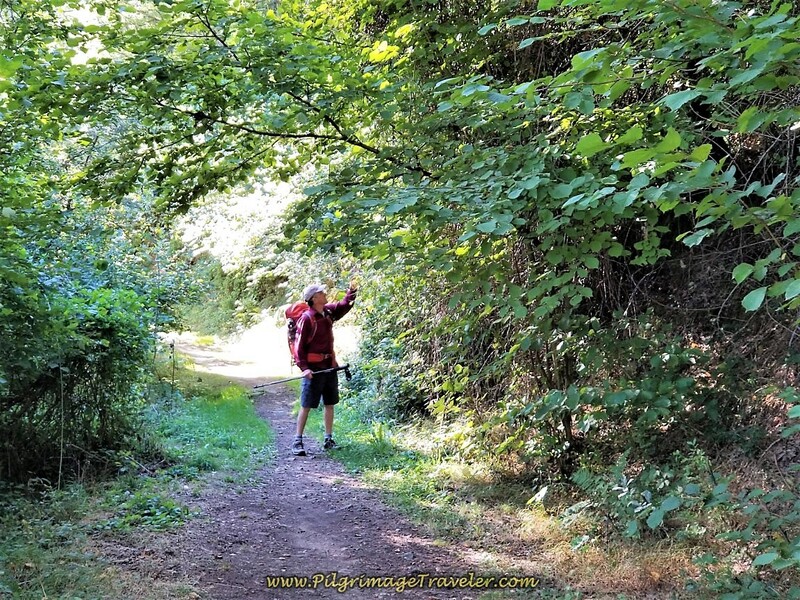 Along this gravel road, Rich would stop frequently to pick and eat blackberries. He just loves them and while I do too, I found myself waiting constantly for him to eat and catch up! 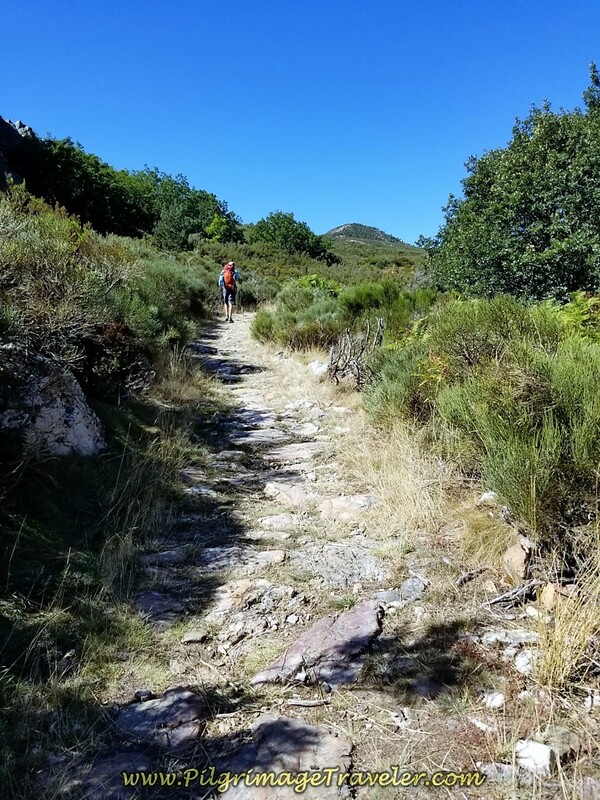 At 6.43 kilometers, on day two of the Camino de San Salvador, a trail turns off the road up and to the left. Take this trail. 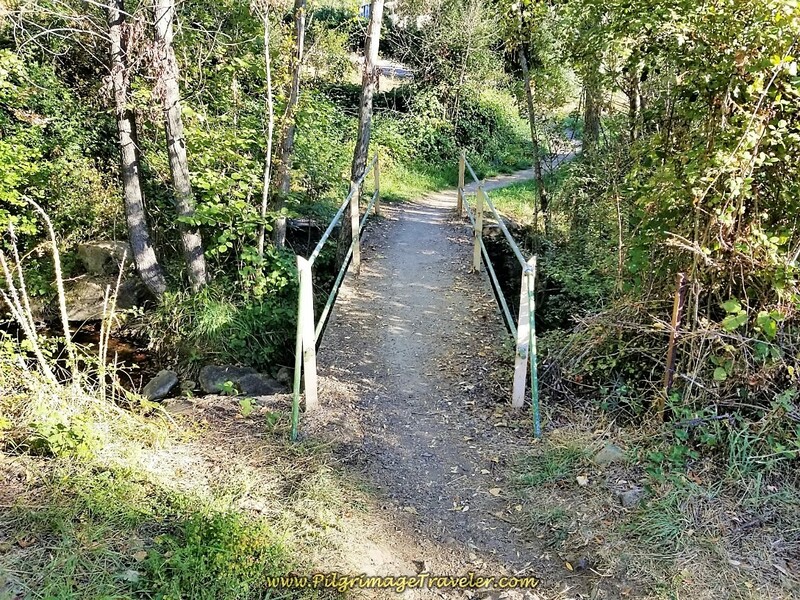 The trail walks over a footbridge that crosses a small arroyo, and soon comes to an end. Our lovely trail ends just beyond the footbridge,and comes out onto a paved road at a water treatment facility. 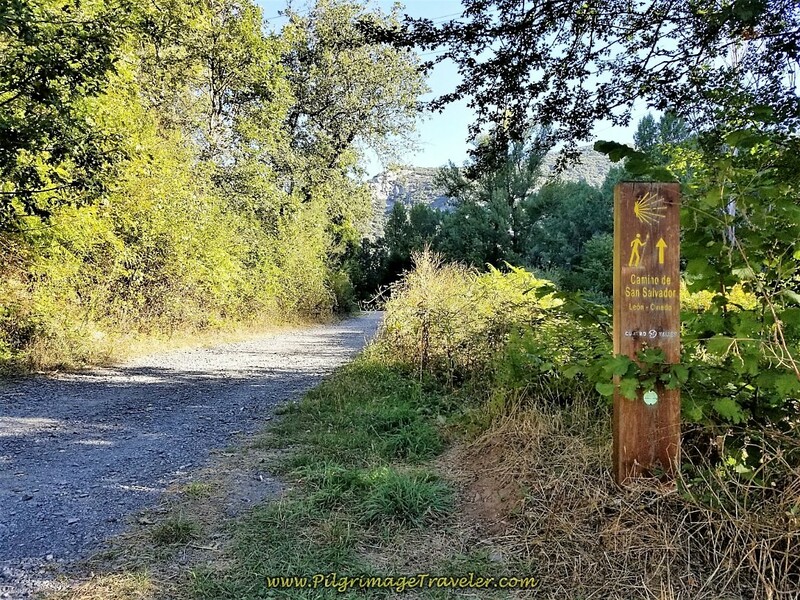 The Camino turns left here. Make your way along this paved road and through this tunnel, shown below. A hill awaits you on the pavement on the other side of the tunnel. Here is my husband Rich, making his way up the hill by the electric substation. The railroad tracks are visible once again on your right with the River Bernesga just farther east. This is not the most beautiful section on day two on the the Camino San Salvador! At the top of the long, hot hill, a water fountain and a shady picnic grove awaits you, if you need a break at this point in your day. 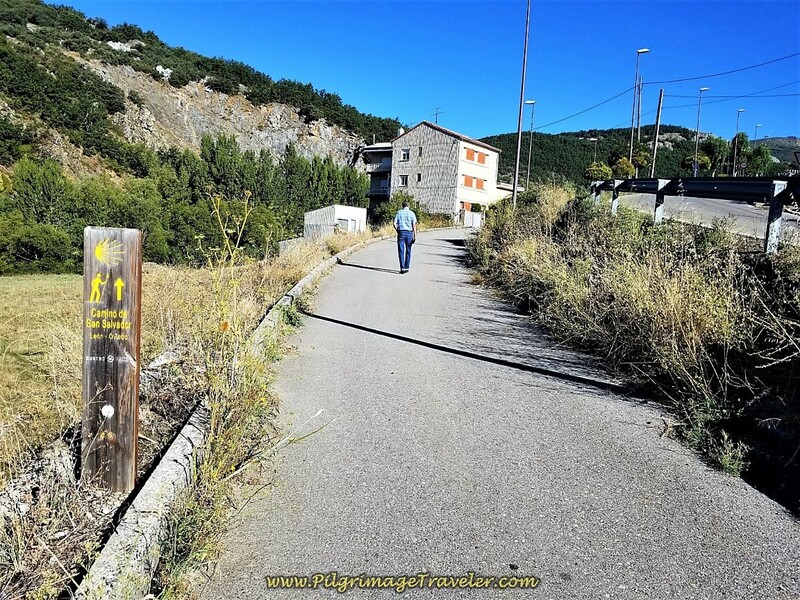 It is only 1/2 kilometer onward to the next town of La Pola de Gordón from here. 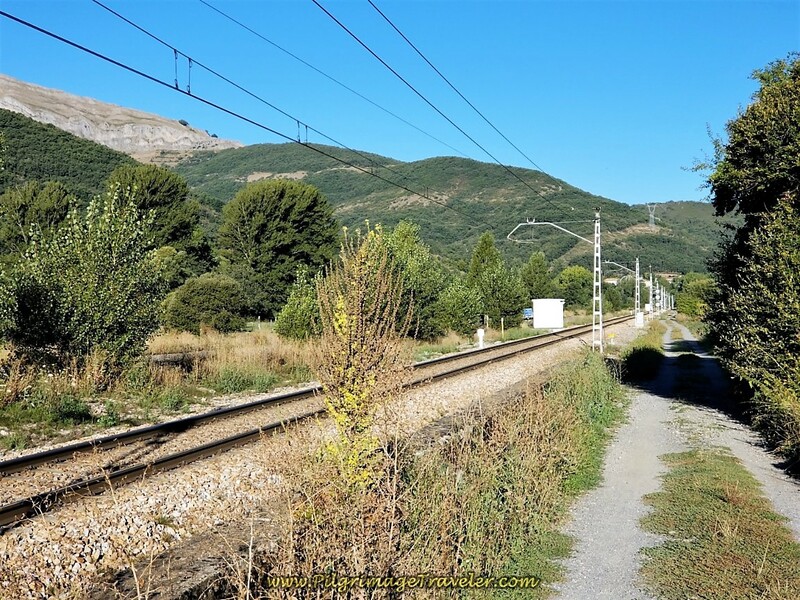 Join the train tracks, and follow them on the parallel road into La Pola de Gordón, for about a kilometer onward, from where you left the trail. Follow the bend in the road and come to an information board when you enter town. 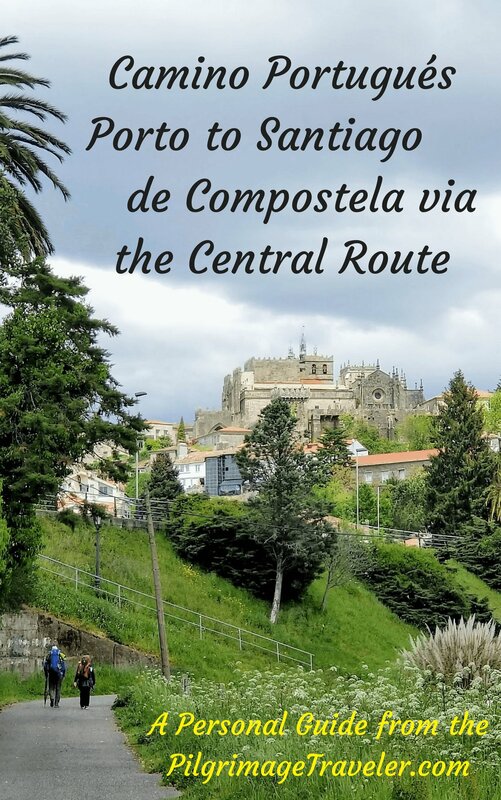 Right after the information board, the Camino takes a right turn on the Calle Villarín and takes you toward the heart of town. First, follow the arrows to this walkway that leads you down stairs to cross under the train tracks. 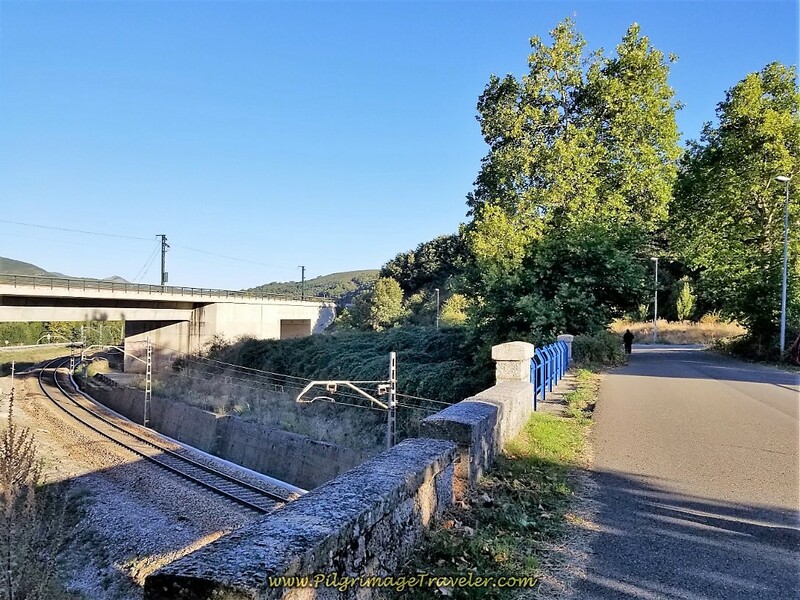 Turn to the right to stay on the Camino and cross the Río Bernesga on a bridge. There is a Pub Bar Gatos Negros immediately to your left after you cross the bridge, where all the cars are parked in the photo above. We totally missed it somehow, I don't know how! The sign for the bar is extremely small, and there were no outdoor tables, which I was expecting to see, so you have to look for the Estrella Galicia beer sign. I also located it on our Google map above. There is also the Pensión El Arenal (+34 987 58 83 03) located at the bar, a second choice if you are planning to stay the night here. 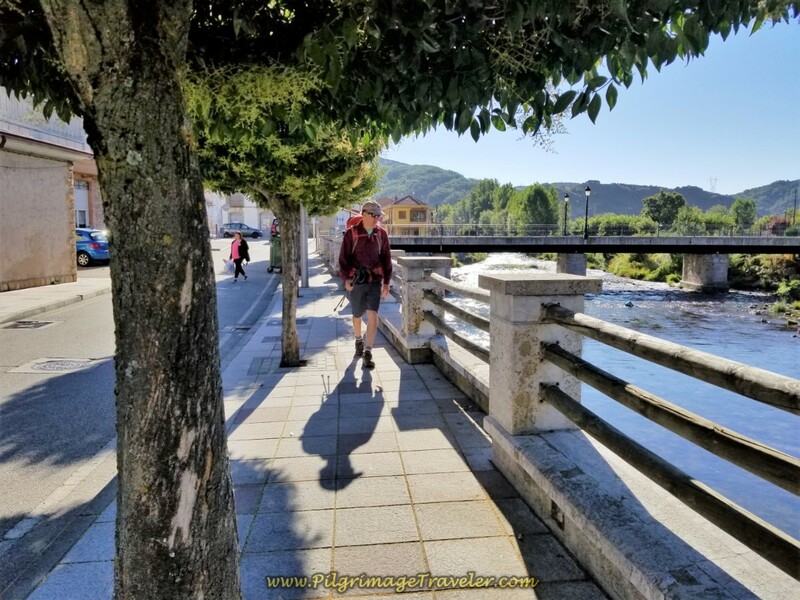 The Camino walks along the river for only about 130 meters, then turns right to head to the center of town. A few meters onward, the Camino turns left, here at the clock tower and onto the Calle La Constitutión. Along this same street, but to the right is the third possible accommodation in town, the Pensión 15 de Mayo (+34 619 44 40 00). Farther along on this main street, you will encounter the Hostal Fontañán. It is not open and is for sale, so no matter what you read, do not count on it. 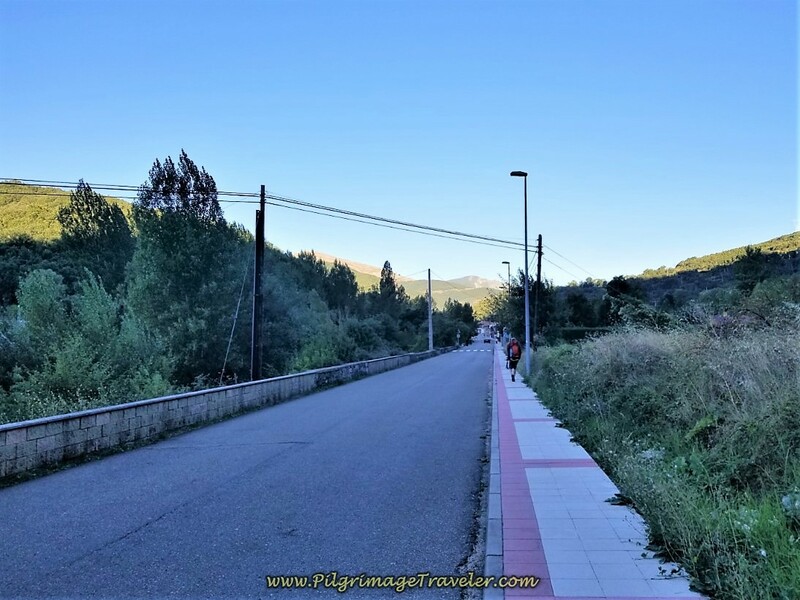 It is only 200 meters through town on the Calle La Constitutión before you see this side path, shown in the photo below, where the Camino turns off the highway. When we realized that we were through town, we tried to double back and find a café. 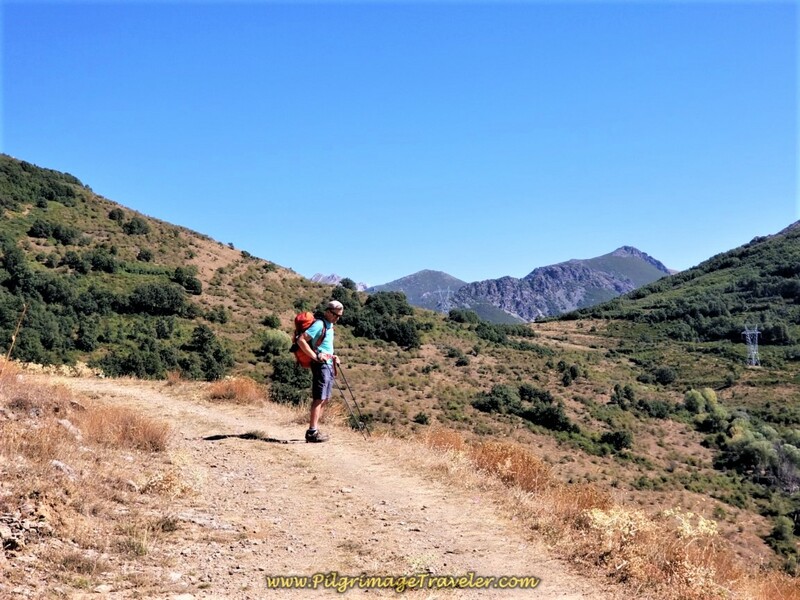 You can see this retracement on our Google map above.Unfortunately, the one we walked off-Camino to find, no longer existed, so we turned about and carried on. 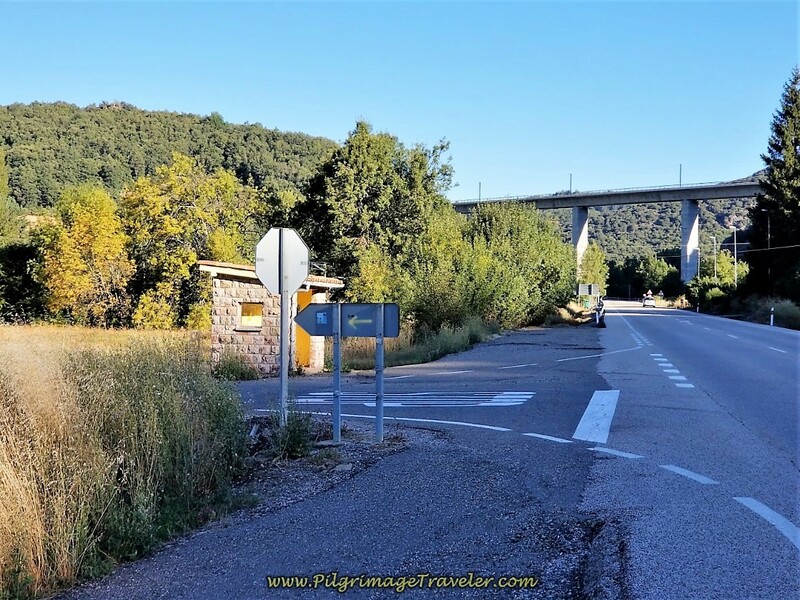 At 9.0 kilometers into day two, we left the main road to enter this pathway, below the main highway, following the Camino de San Salvador sign. Continue on this gravel roadway. 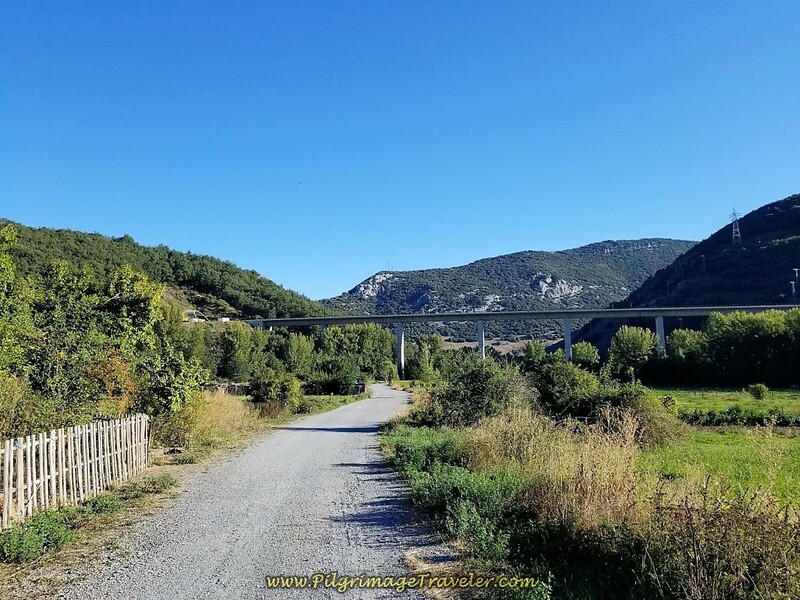 The path drops down to and walks along the Bernesga River, and takes the pilgrimage traveler under this bridge that contains the railroad tracks and comes back up on the other side and out onto the pavement. It is only about 1/2 kilometer on this path from the turnoff in town. Join the LE-473, just downhill from a plaza where there is a gas station on the road, off Camino to your right. This gas station may be your last chance for a cup of coffee or a snack, before the end of the day in Poladura de la Tercia. There are no services after this! 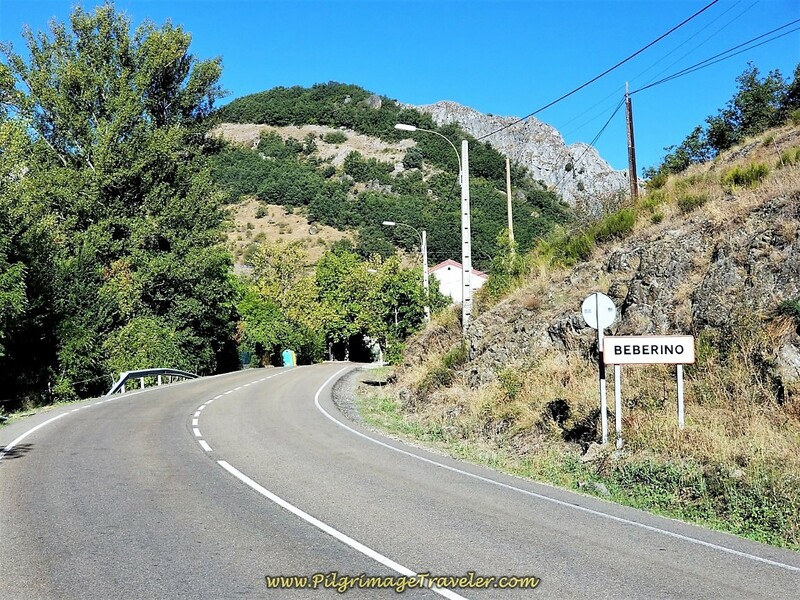 Turn left onto the LE-473 and head northwest toward the next hamlet of Beberino. There is not much of a shoulder along this highway, so exercise caution! 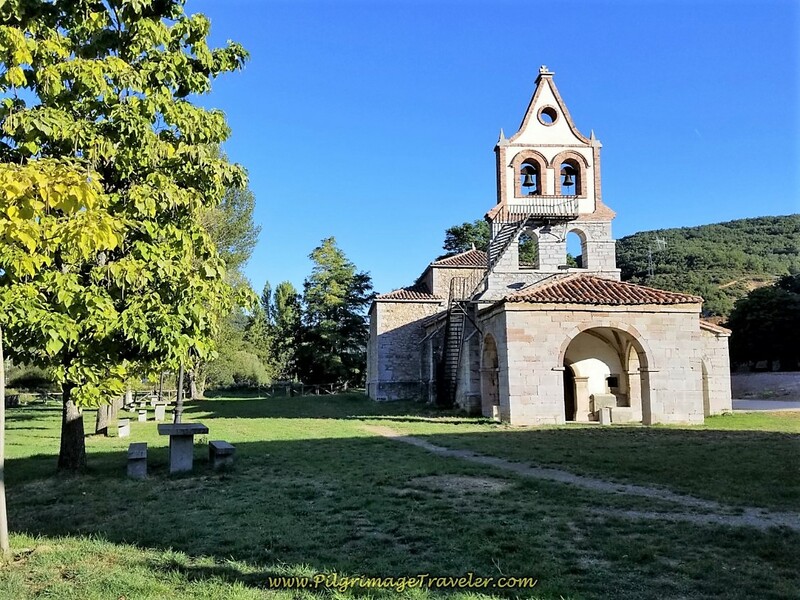 In 1/2 kilometer, arrive in the center of Beberino at the church on your right and a fountain on your left, where you can replenish your water supply if needed. 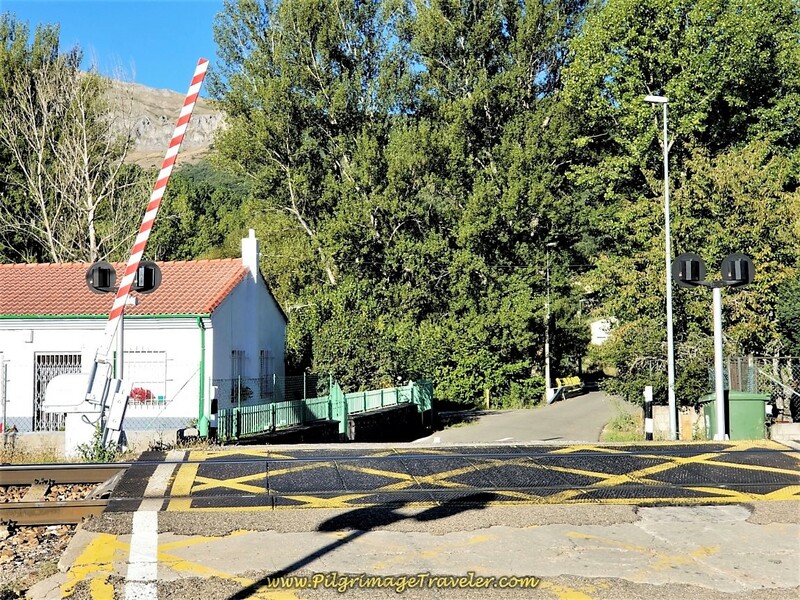 After walking through Beberino in about 1.0 kilometers from the church along the LE-473 and at 11.1 kilometers into day two on the Camino de San Salvador, come to this intersection below. Turn right here onto the CV-103-1 towards Buiza. Snuggle up to this road as you will be on it for about 2.6 kilometers from this turn, along the CV-103-1 until you reach Buiza. It is a quiet road without a lot of traffic, but there are big bends in the road as it climbs, so stay alert at all times, because there is no shoulder to walk upon. 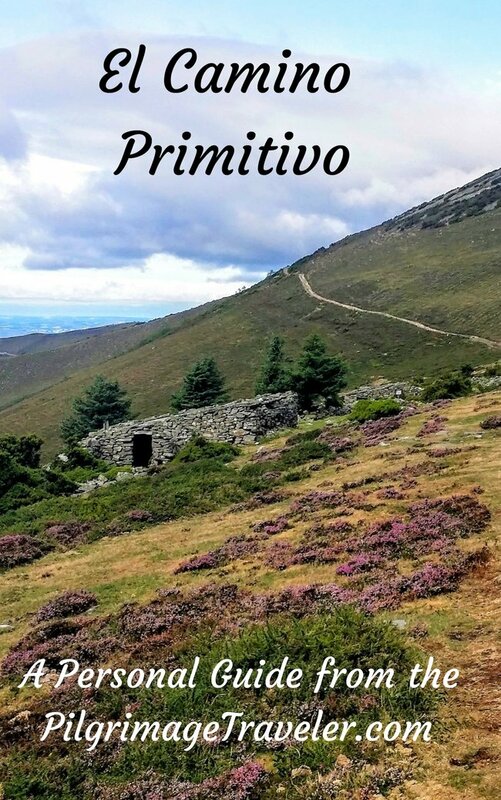 In about 1.3 kilometers, after the turn, pass by the historic Ermita Virgen del Valle. 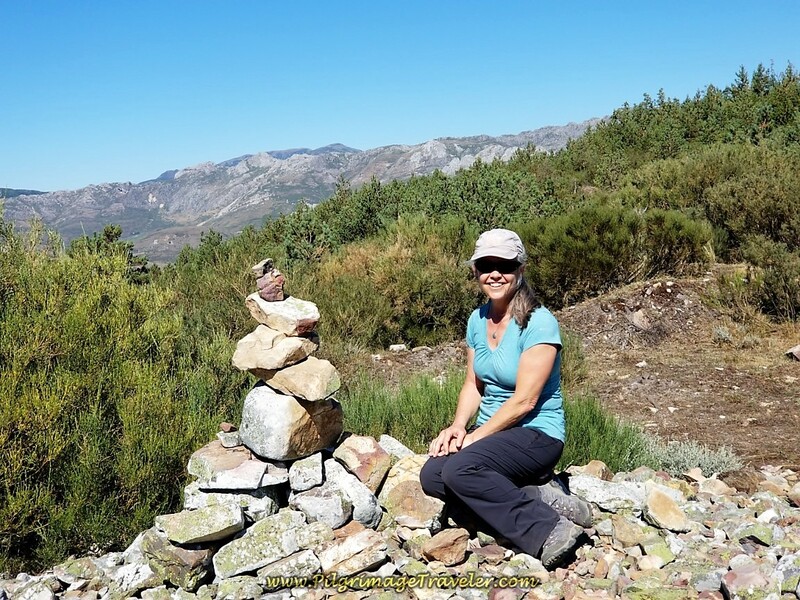 At about 13,25 km into day two on the Camino San Salvador, come to a wolf on the ridge above! 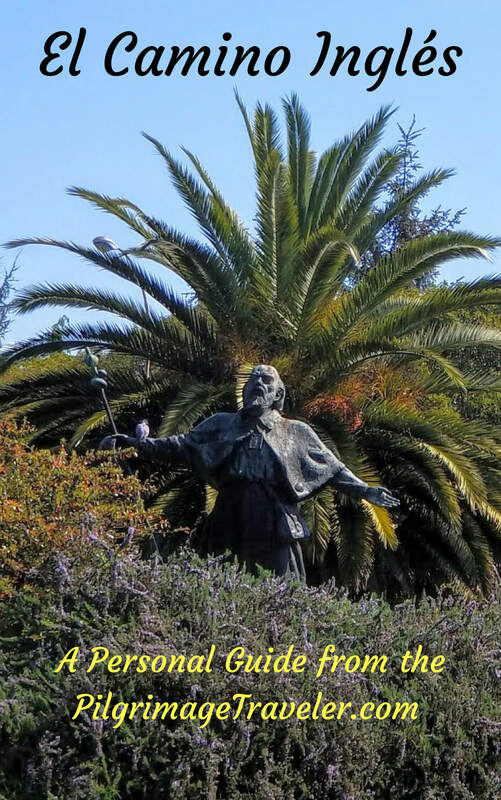 When you see him you know you are getting close to Buiza. He fooled us for a moment, then we realized he didn't move! 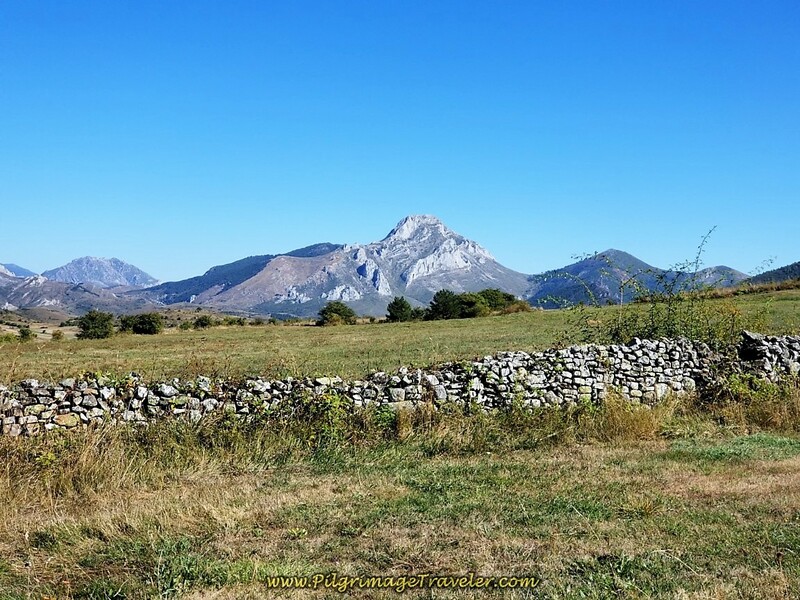 At 13.65 kilometers, come to the sign for the city limits of Buiza, at the foot of the mountain, shown below. The town is a really, really quiet place! 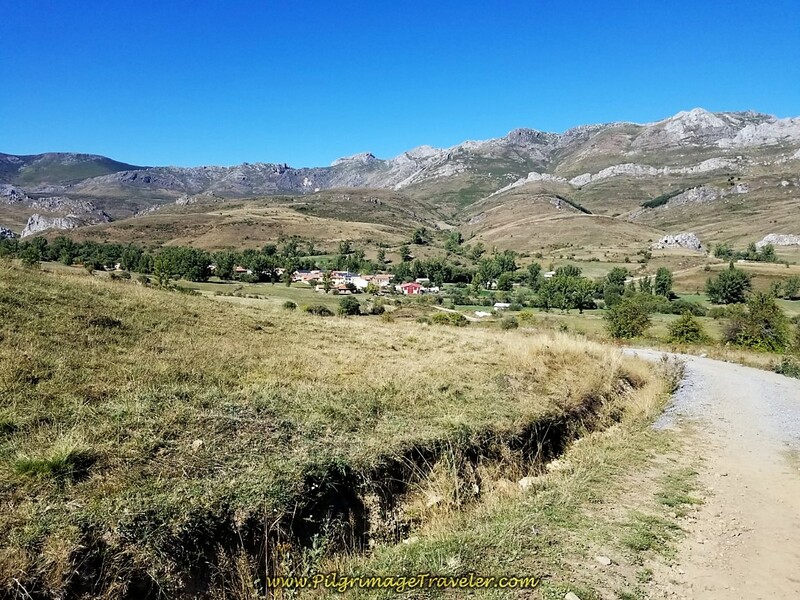 Barely 100 meters onward, at 13.75 kilometers, look for the brightly colored flags ahead, which marks the park and the Albergue de Peregrinos de Buiza. 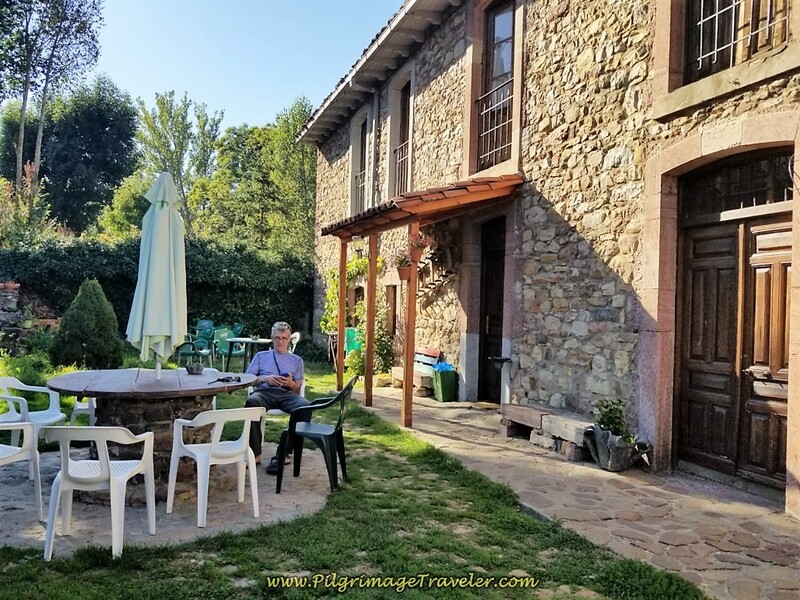 The albergue is a lovely and clean place, with a nice kitchen for cooking. We stopped here in the shade for a bite of lunch from our pack. Despite what information you may have about a café bar here in Buiza, the locals confirmed that there are no reliable hours when it is open. You may get lucky when you arrive, but it is best to come prepared if you are planning to stay the night. The hospitalera immediately saw us sitting outside, and came from somewhere, inviting us inside. We explained we were only here for a break, but did make ourselves a cup of refreshing tea with water heated in the albergue and from our own tea bags in our pack. 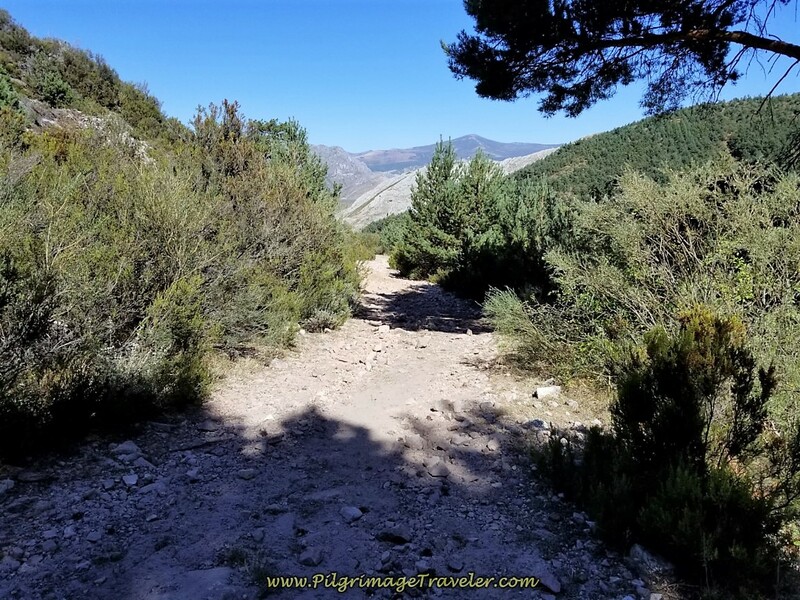 At less than 14 kilometers into our day two, we wanted to journey on farther on the Camino de San Salvador. Just beyond the albergue there is another information board. 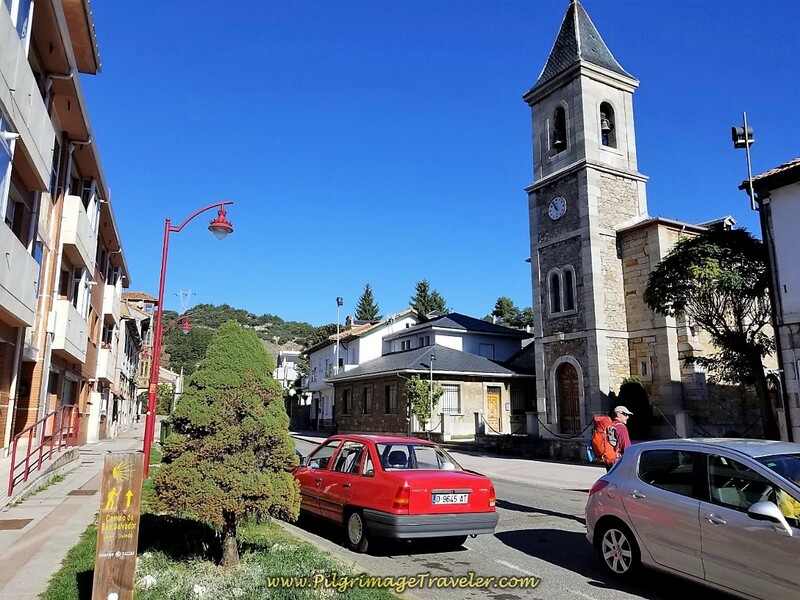 In about 350 meters from the albergue, come to this intersection with a water fountain, shown below. 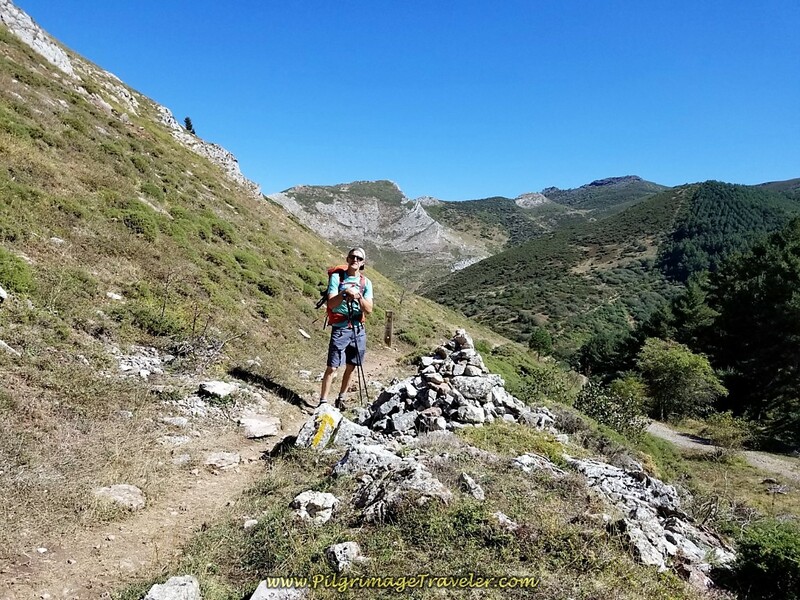 Fill your water bottles if you need water, as this will be your last opportunity before the final destination in Poladura de la Tercia, more than eight kilometers away. 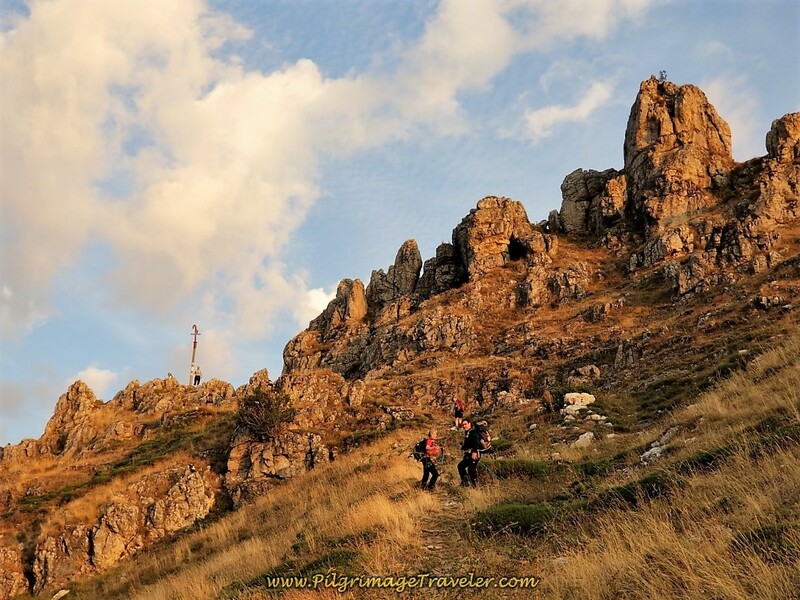 It is nothing but mountain trails and climbing from here to Poladura! 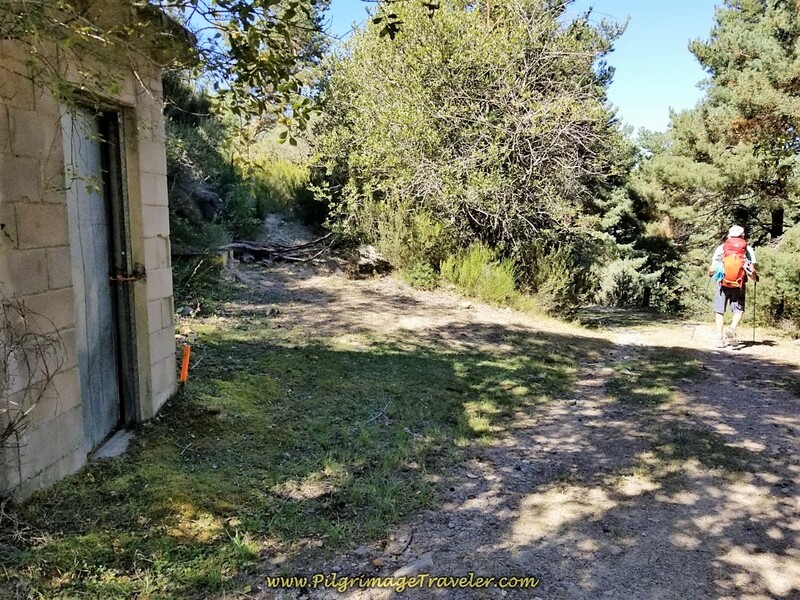 Turn left at the fountain and then an immediate right at the split rail fence and onto the Calle las Sierras. Go only 50 meters and see the yellow arrows directing you to turn left again,shown in the photo below. 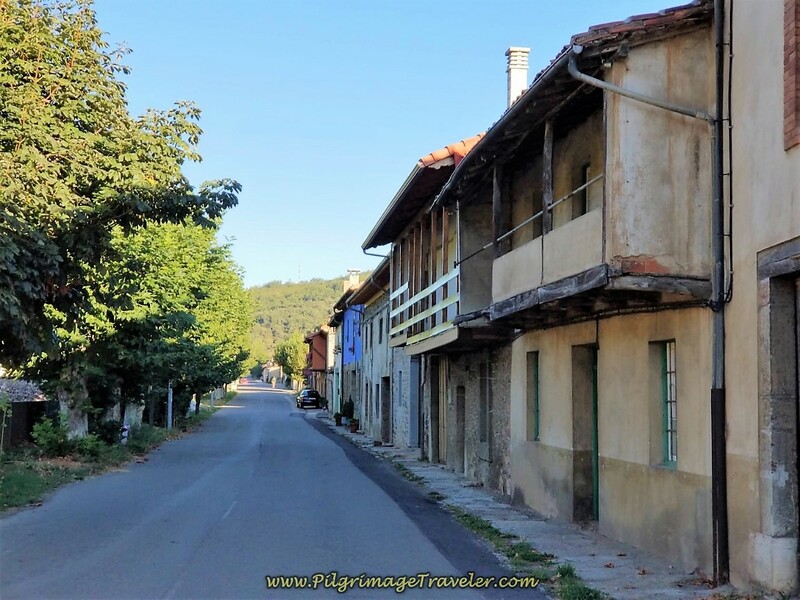 At this turn, if you were to go straight, and by the town church, you would encounter a second possibility for accommodation, the Buiza Rural. Book ahead if you'd like to stay here instead of the albergue. Continue on this street as it bends and climbs steeply out of town, a gorgeous and quaint little place. At the last house in town, a Spanish homeowner saw Rich pulling a plum out of a tree. He asked him if he likes plums and invites us to his house to pick more. He wanted to fill our packs with plums! We took quite a bit, thanked the man and walked onward. Plums, ripe off the tree in Spain are delicious and sweet! 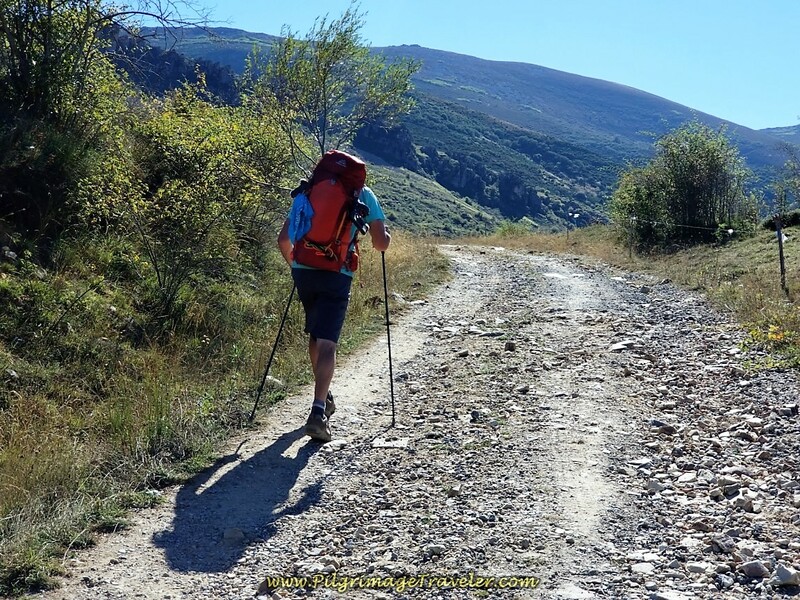 While the Camino begins its climb in town, the real climb begins after you leave it. As you leave town, the road soon turns to gravel. A different set of waymarkers greet you, always with the assurance that you are on the right track. 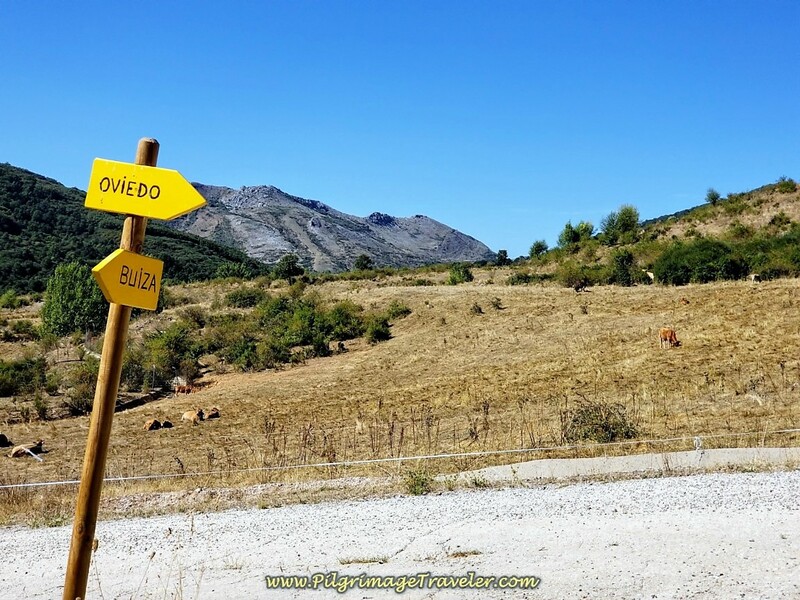 Here is a wooden one that simply states "Camino de Santiago-Oviedo," that you encounter after leaving Buiza. 300 meters after the Camino becomes a dirt track, you make a right hand turn at this sign below. In yet another 300 meters, turn left from the gravel road and onto this path, below. 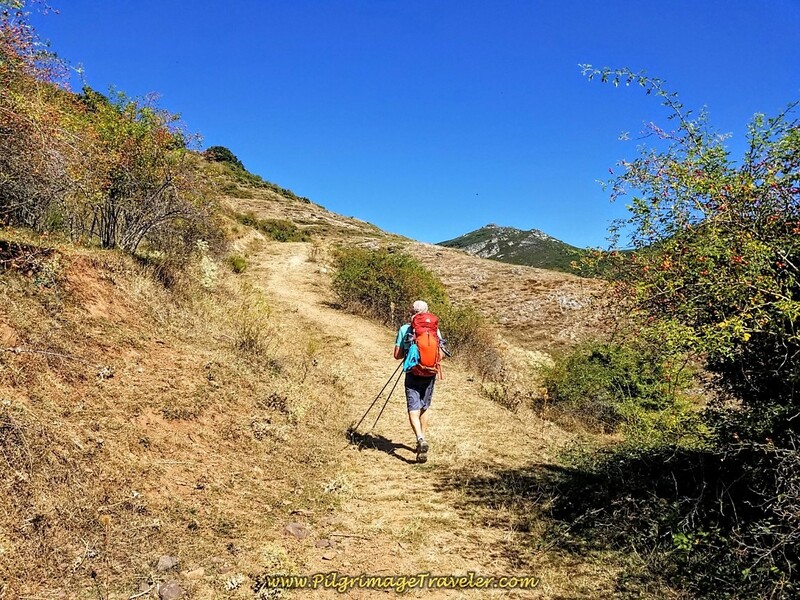 The Camino de San Salvador, on day two starts to really climb steeply now. 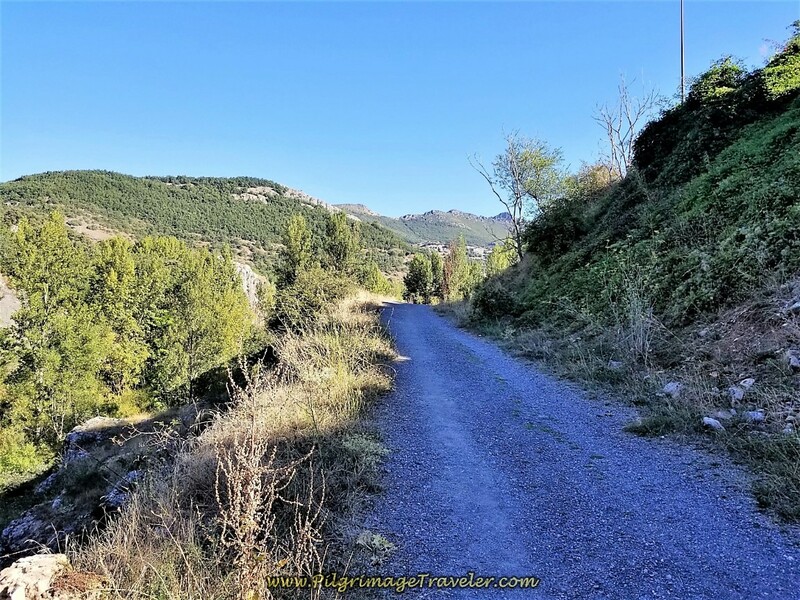 As you continue your climb, many lovely views open up of Buiza in the valley below and behind you, just as tall mountains appear ahead before you. 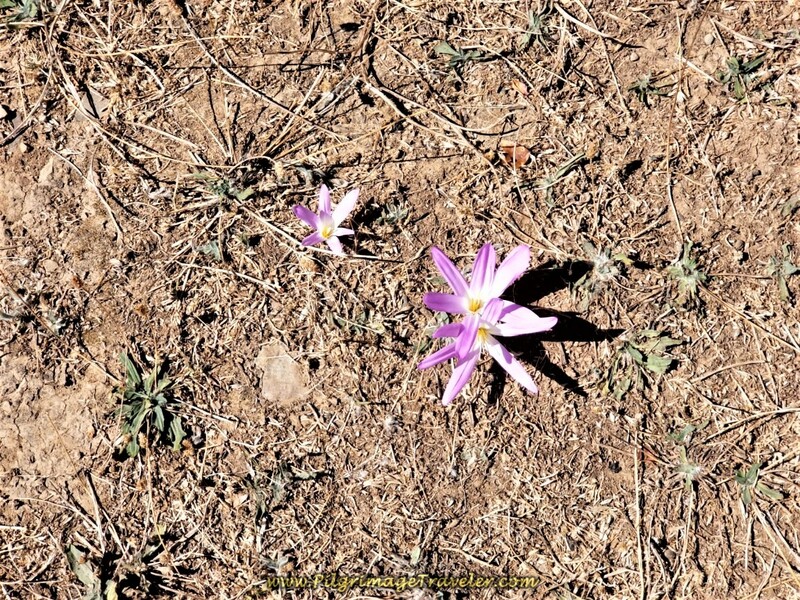 This bright little pink flower, shown below, brightened our path, growing close to the ground because of the harshness of the weather. It is a bulb-grower whose flower comes first, in August, then the leaves come later. It is called Colchicum Montanum or August Crocus, in English and Merendera Montana in Spanish. 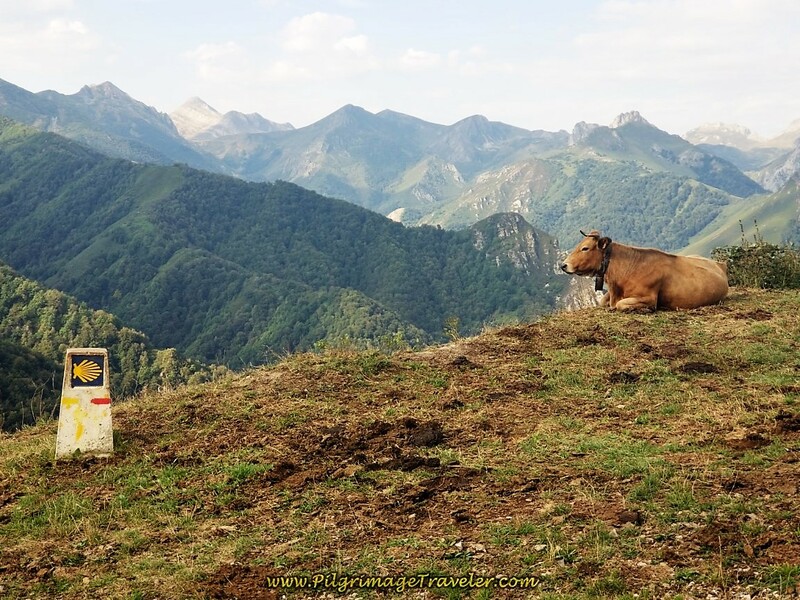 We saw these as well, all along the Camino Primitivo! 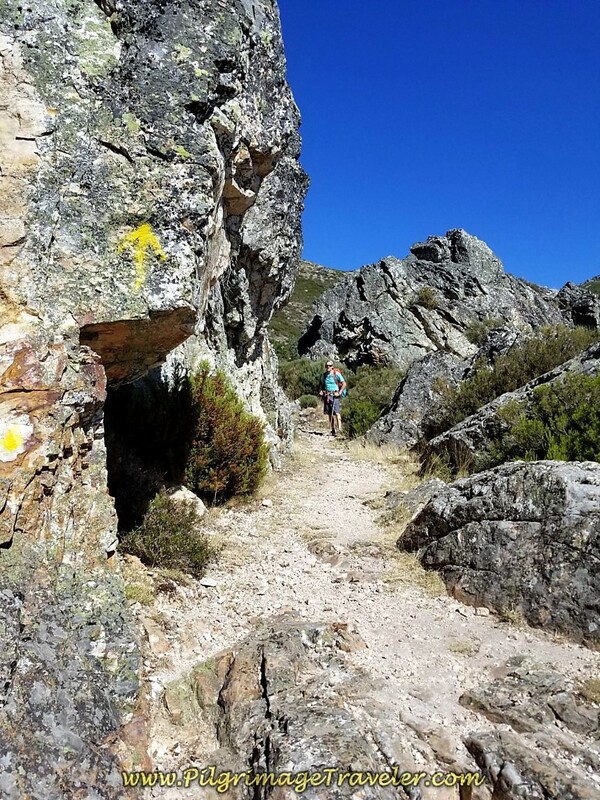 In about another one-and-a-quarter kilometer, come to this bend in the trail, where the rock formations become more dramatic. 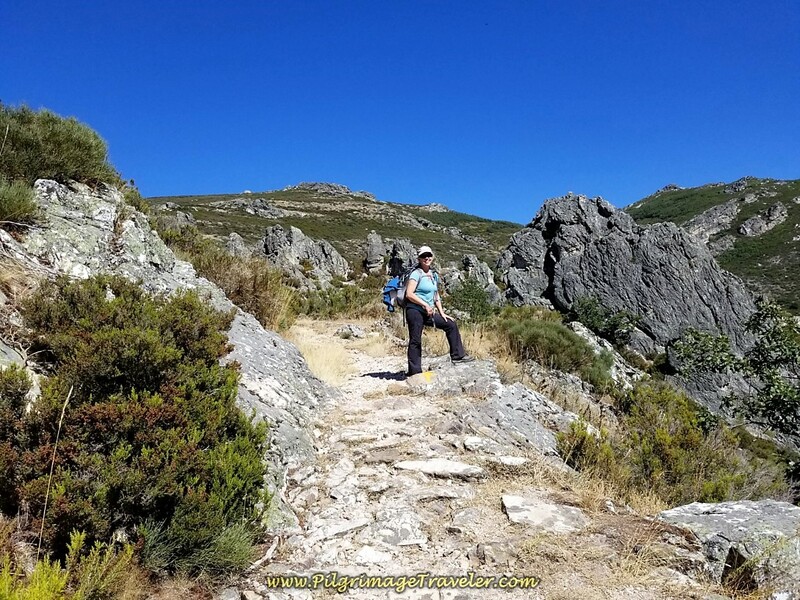 Welcome to the Forcadas de San Antón, the name of these rock formations. 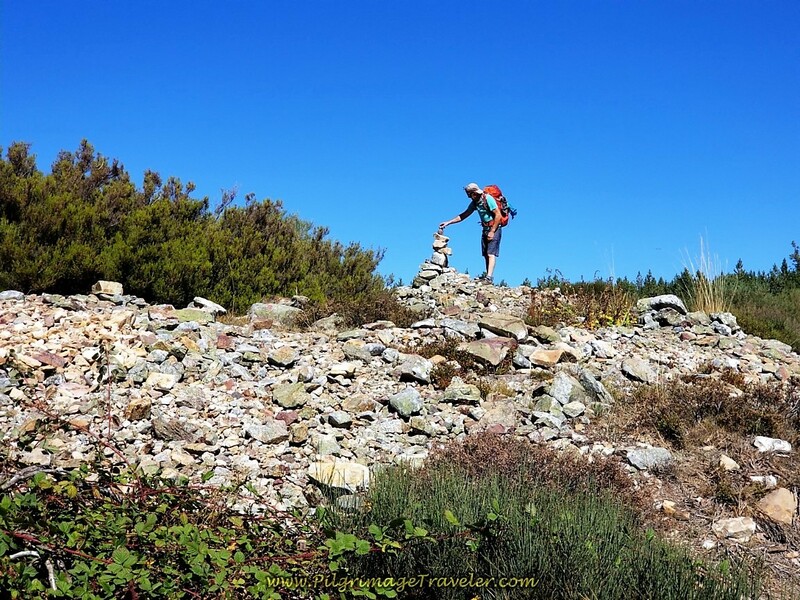 Take heart, because at this point you are less than one kilometer from the "alto" or the top! 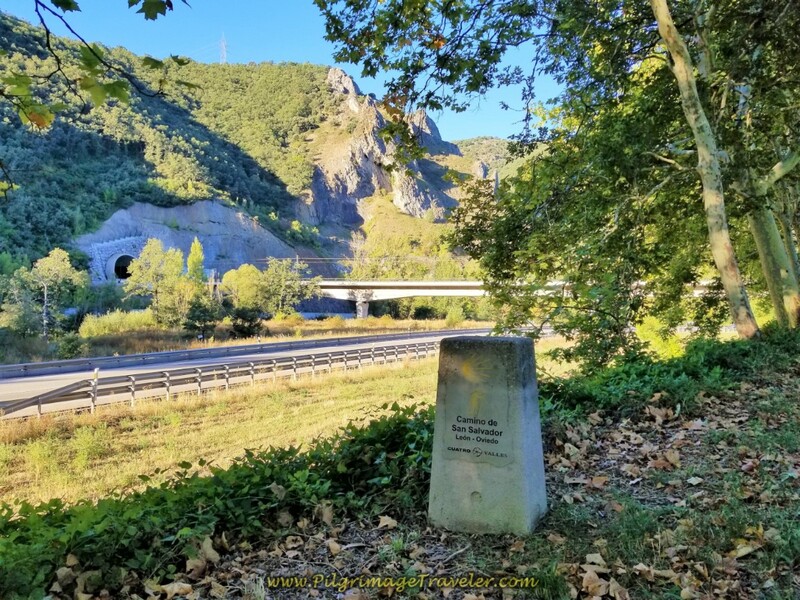 The Camino through here was once the old Roman road from Legio (León) to Llugo de Llanera (Asturias) according to a Spanish journalist Xurde Morán. You can most certainly see remnants of the road! It is a step back in time, for sure. When the square summit top of Chanza Peak comes into view, you are almost there! At 16.99 kilometers and at 1463 meters you finally reach the top. 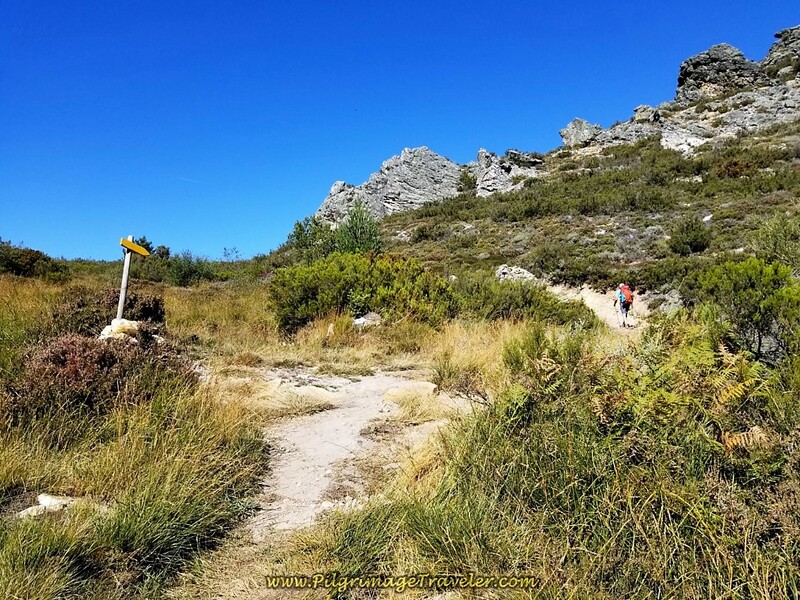 It is only 3.24 kilometers from the albergue in Buiza to the top of your climb on day two of the Camino de San Salvador. However, it will feel like you have come farther! We spent some time on the summit, having a picnic and enjoying the view after the long day's effort. 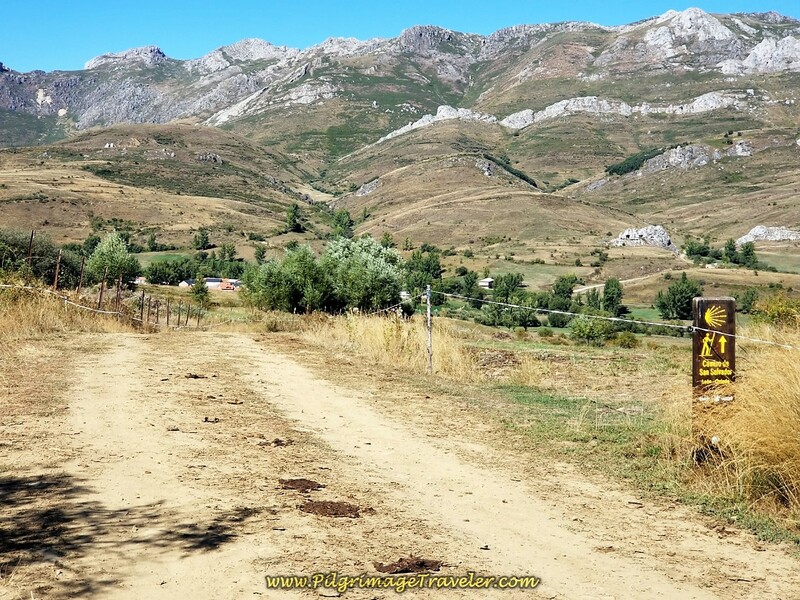 Here is a photo of the descent to the Valle de la Tercia on the other side. 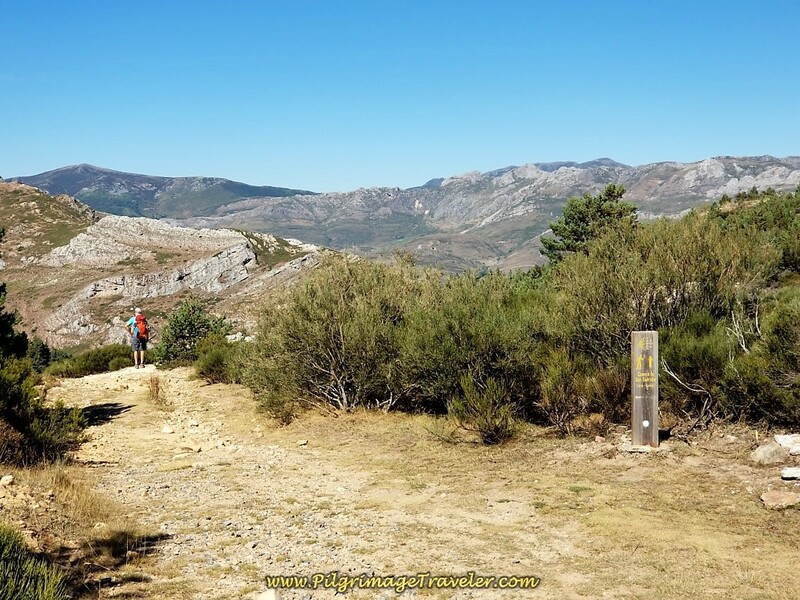 You still have 6.6 kilometers to Poladura de la Tercia from here, more than an hour's walk. 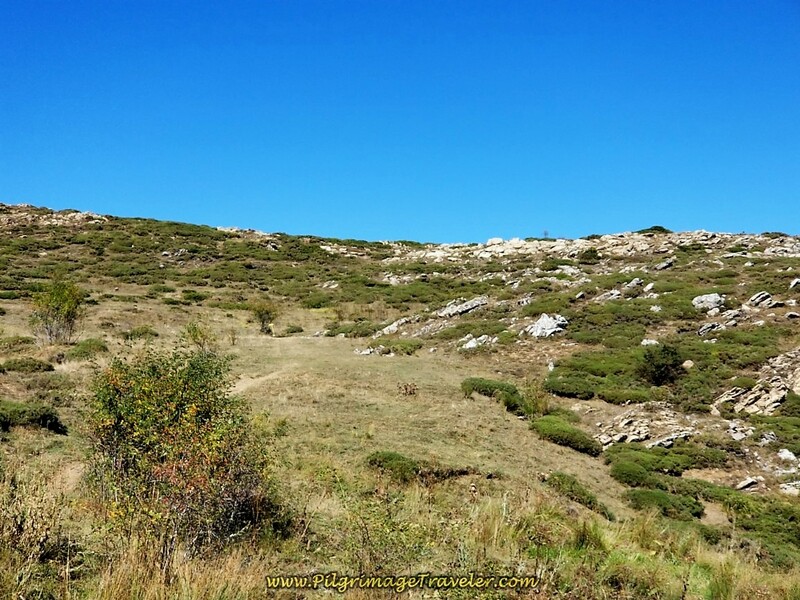 About 600 meters beyond the summit top, come to the first water control station, shown in the photo below. Stay to the right. The other turn was blocked off with logs when we walked through here. 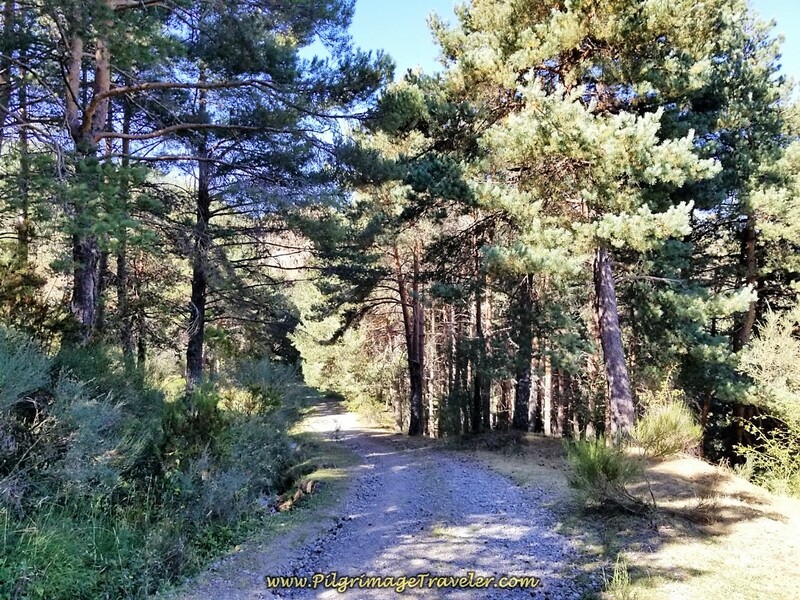 Continue your descent into a luscious and cool pine forest. 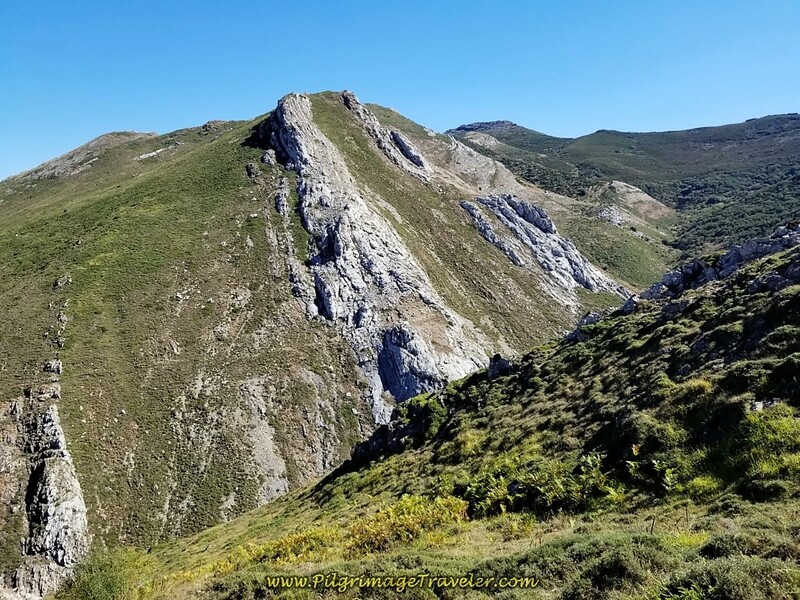 Come to the top of a ridge where you can see the trail ahead as it traverses the mountain called the Barrancón, shown in the photo below. 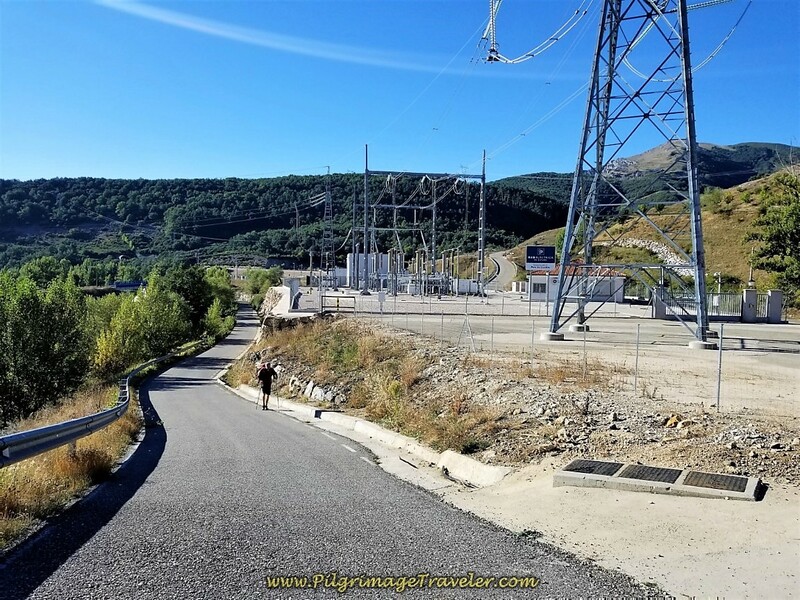 At 18.35 kilometers into day two on the Camino de San Salvador, about 600 meters beyond the first water control station, come to the second one. 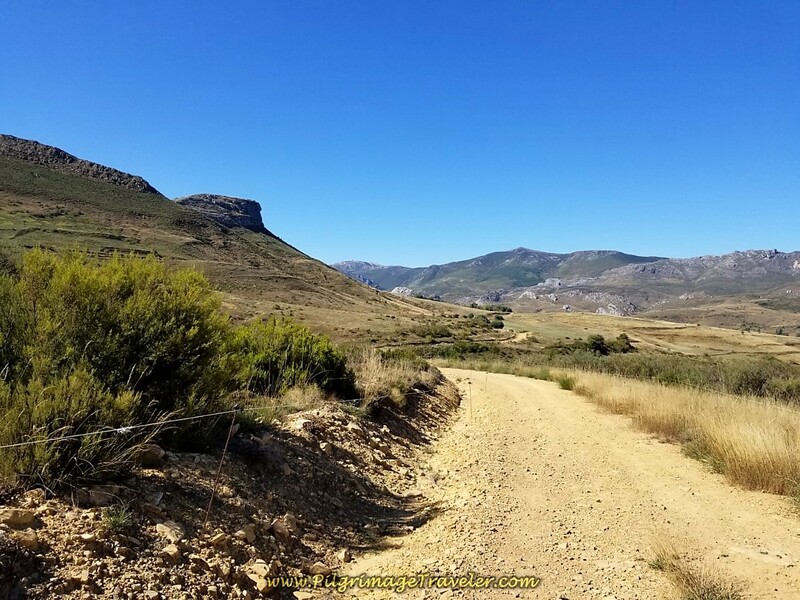 Leave the gravel road here and turn left onto a more rugged goat trail. 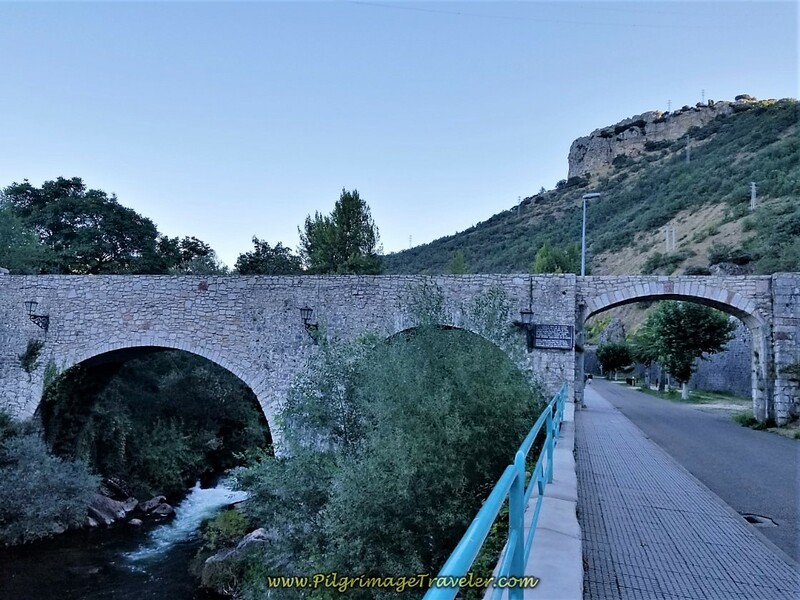 Apparently, if the weather is horrible or too snowy, instead of turning left at the second water station, you can go straight and through the narrow gorge of the Arroyo Barranquillo, and to the Holy Queen's Cross marker. 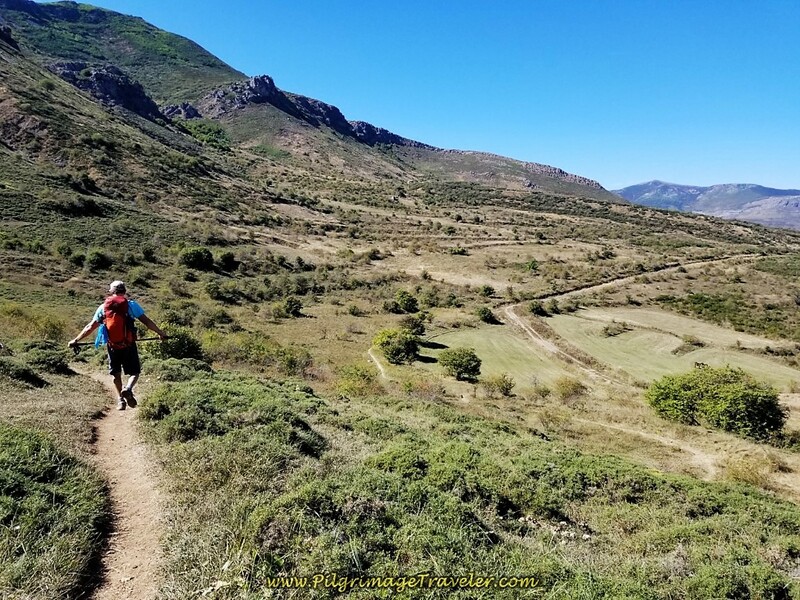 According to Ender, a well-known Spanish Camino de San Salvador enthusiast, this option is only 200 meters longer, and joins the main route after only one kilometer. Here is Rich at the large cairn on the high, rugged track, just beyond the water station. 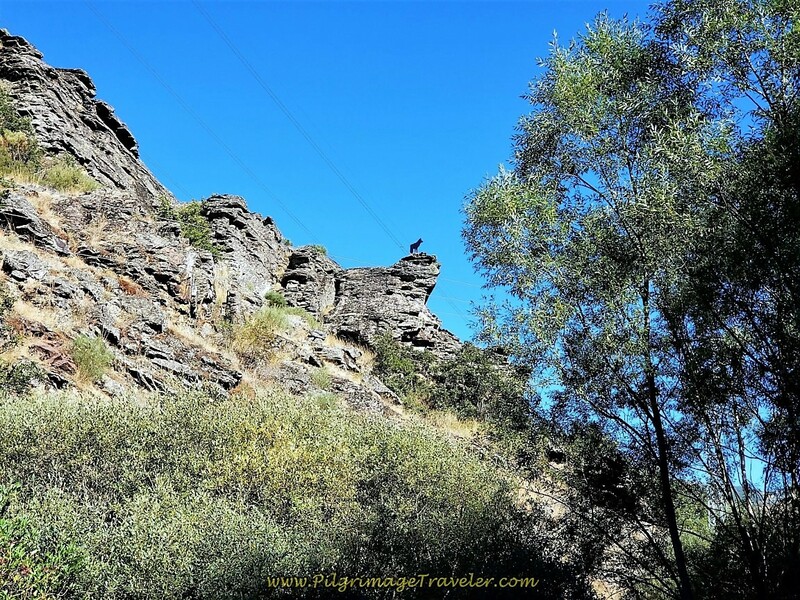 If for some reason you went straight on the road, seen to the right in the photo below, you shouldn't miss this prominent pile of rocks and can climb back up to it! The scenery is quite dramatic through here, so I would take the high road, if at all possible! There are many goat tracks through here, but just stay on the most prominent one. 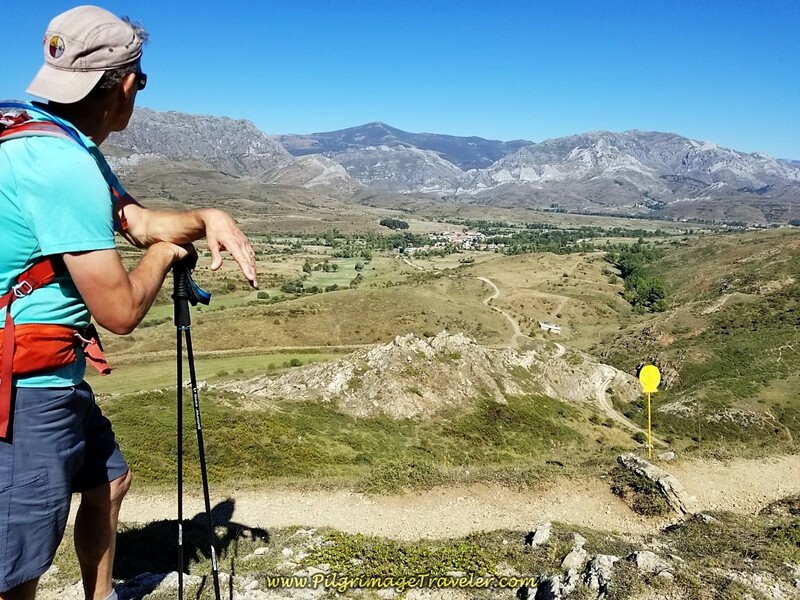 Here I am in the photo below, at the turning point that affords the pilgrimage traveler a dramatic view over the Barranquillo arroyo cut. This cut below is the alternative route to take, if the weather is bad. 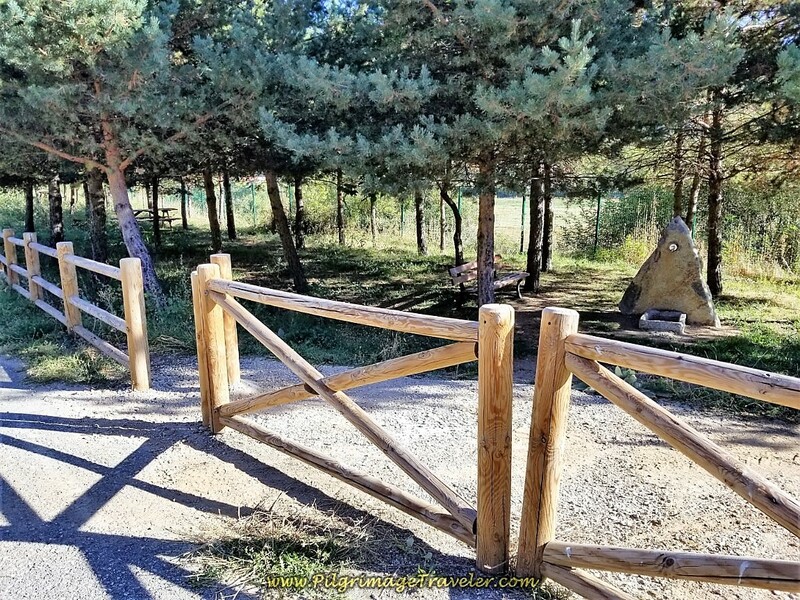 It is at 18.89 kilometers into day two on the Camino de San Salvador, or 550 meters from the second water control station when you come to the top of this second look out. 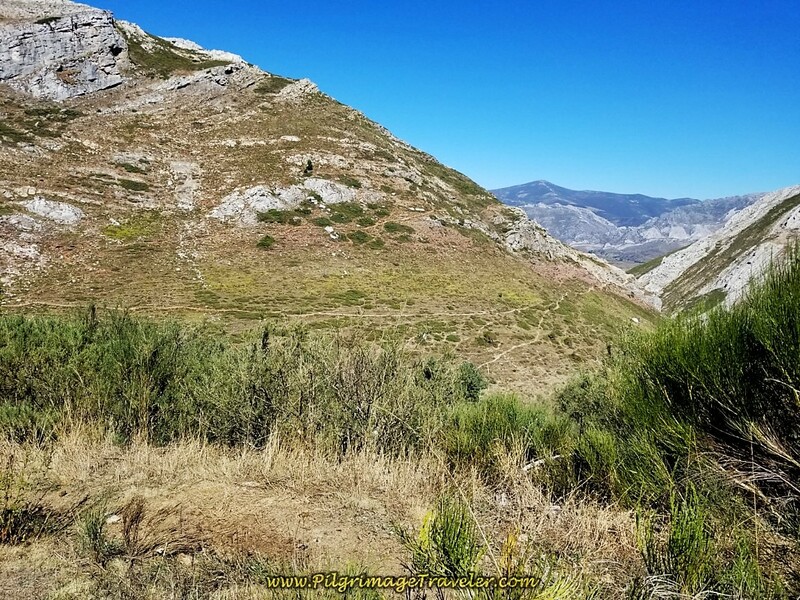 From this high point, there is a dramatic descent into the Valle de la Tercia. 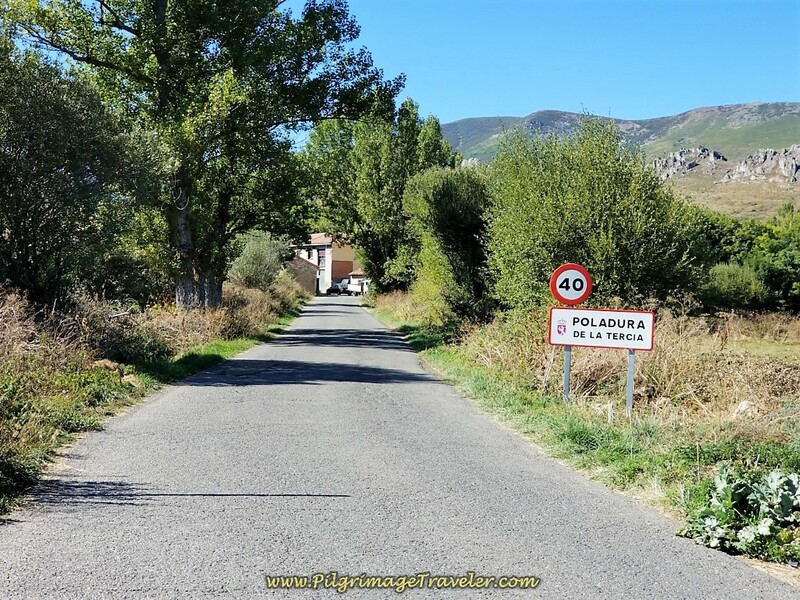 You still have not quite five kilometers left to go to Poladura de la Tercia. But first, drop down into and cross this high meadow to the next viewpoint. At 19.26 kilometers, we stopped briefly at the top of this final high viewpoint. 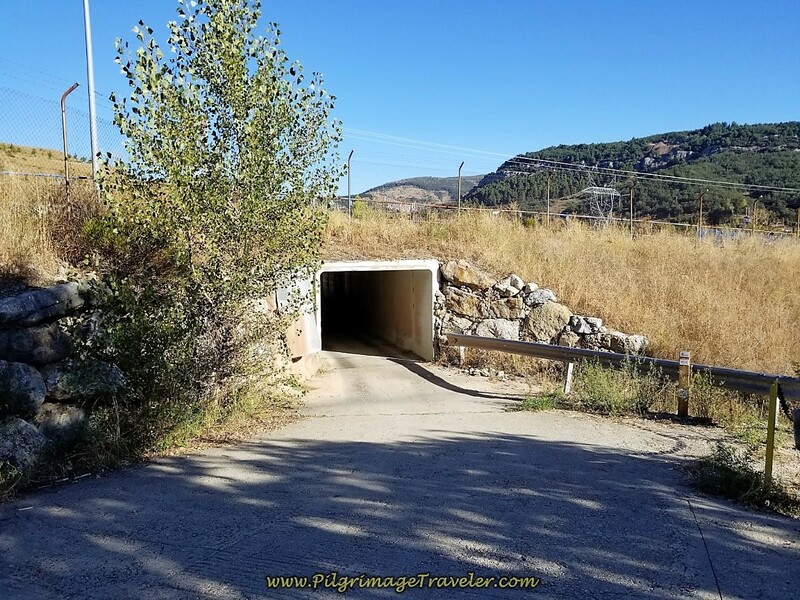 The yellow shell metal markers through here were created by a group of Camino de San Salvador enthusiasts, including Ender, who according to the Confraternity of St, James, welded and painted these signs himself! Thank-you Ender! 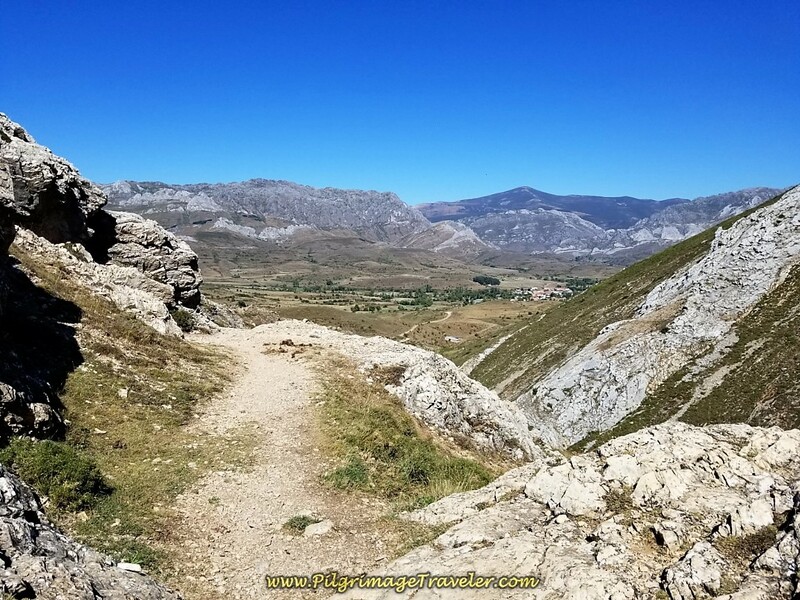 As we continued our descent, with the Carba Mountain on our right shoulder views of the Tercia valley open up, and the town of Rodiezmo is seen directly to the north, shown in the photo below. Rodiezmo is not your destination. 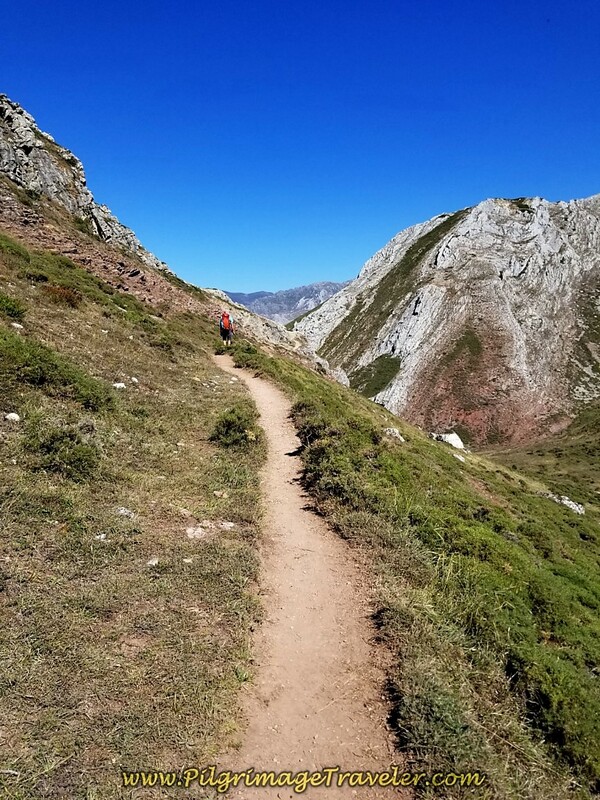 As the trail descends steeply, it switchbacks and heads in a more northwestern direction. The views of the valley from here are quite dramatic! 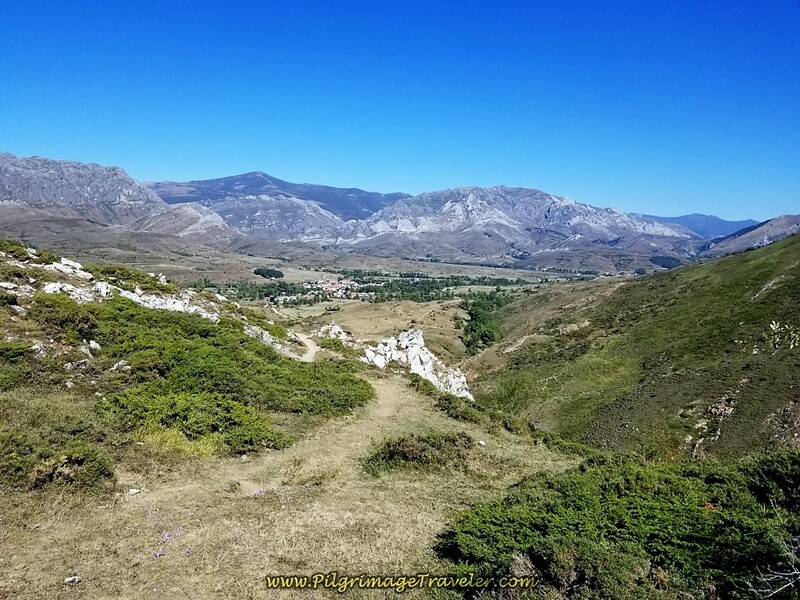 You can see how our Camino trail stays high and hugs the hillside, skirting along it, instead of dropping right away into the valley toward Rodiezmo. 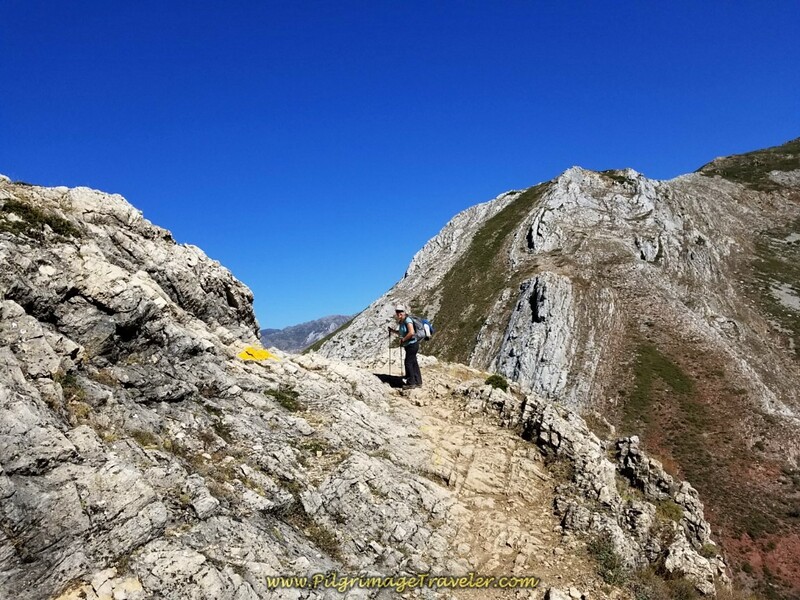 Continue your descending traverse of the Barrancón mountain. 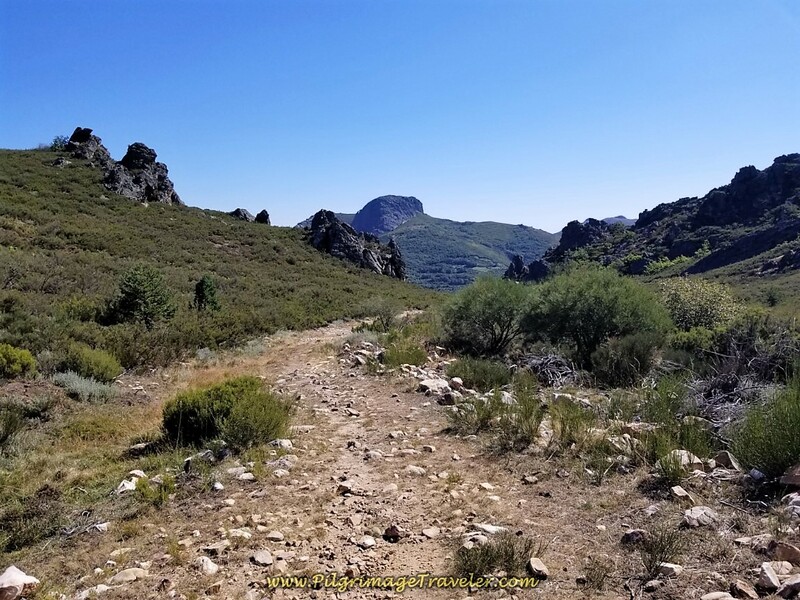 You can see the dirt road below you, to the right, in the photo, where the walk from the Barranquillo gorge will eventually join up with the high trail, ahead. 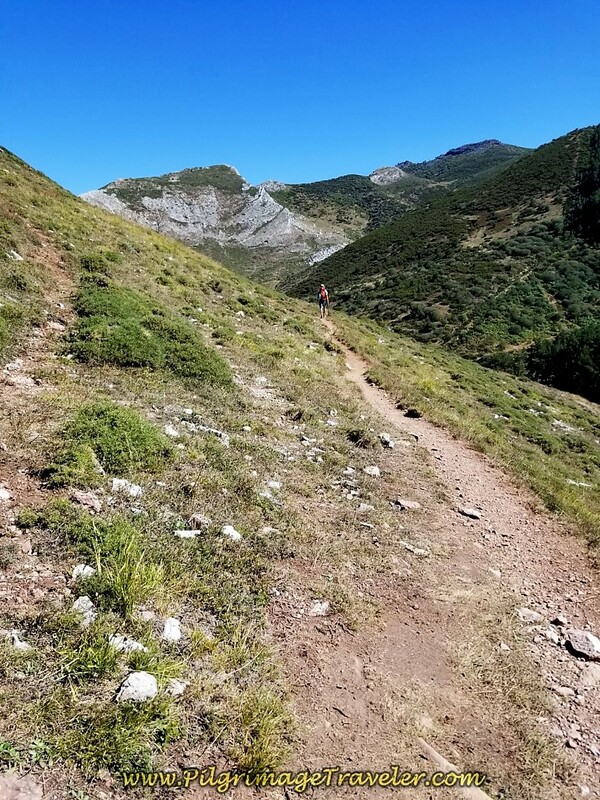 Here is where the trail meets the road, and takes a left turn, not quite 1/2 kilometer after the final high viewpoint, at 19.72 kilometers into day two on the Camino de San Salvador. Only four kilometers left in the day! 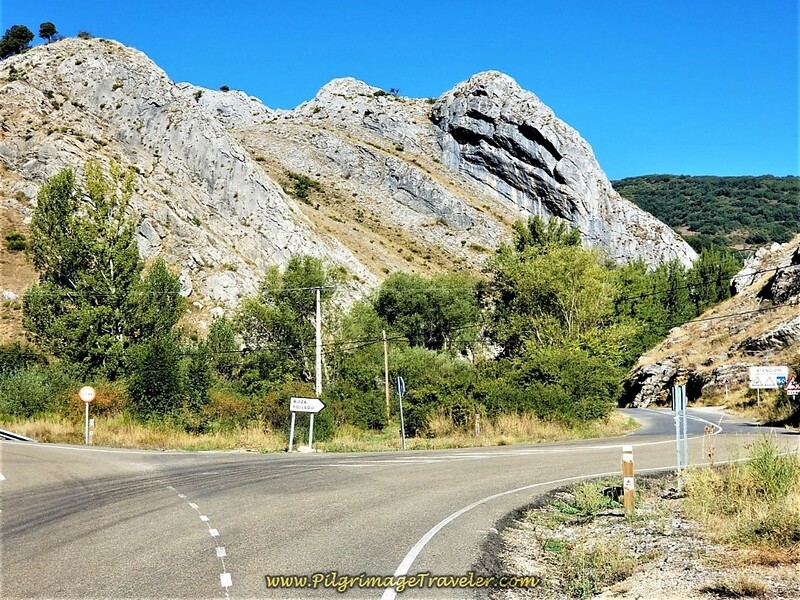 This final road section is on an open and hot road towards Poladura de la Tercia, but the amazing views of the valley continue. 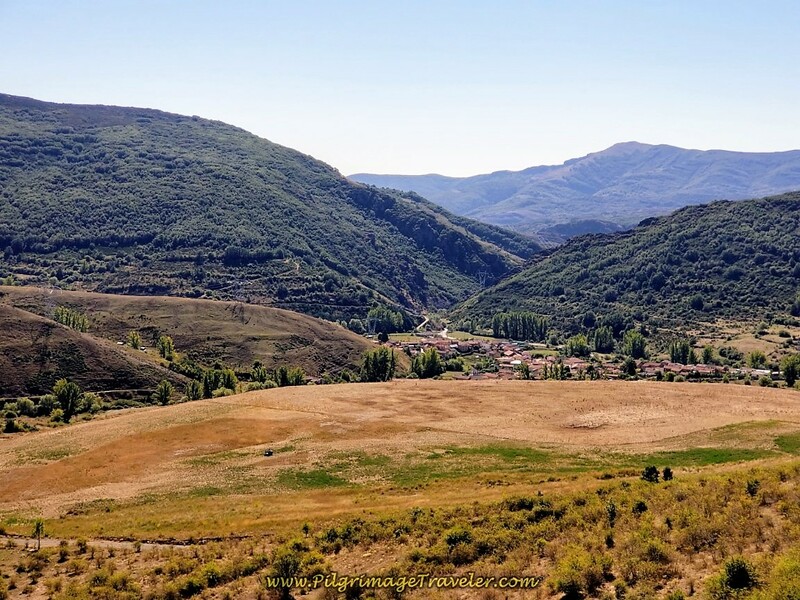 And then finally, as the road continues to descend, the next hamlet of San Martín de la Tercia becomes distinguishable. 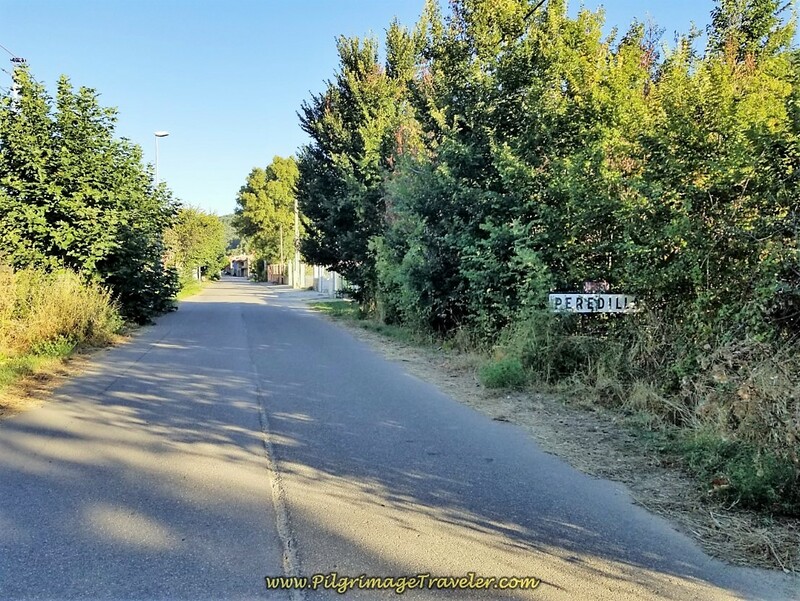 The dirt road takes you by a small cemetery on the outskirts of town, and then becomes paved as it enters the small village about 2.4 kilometers after joining the wider dirt road. 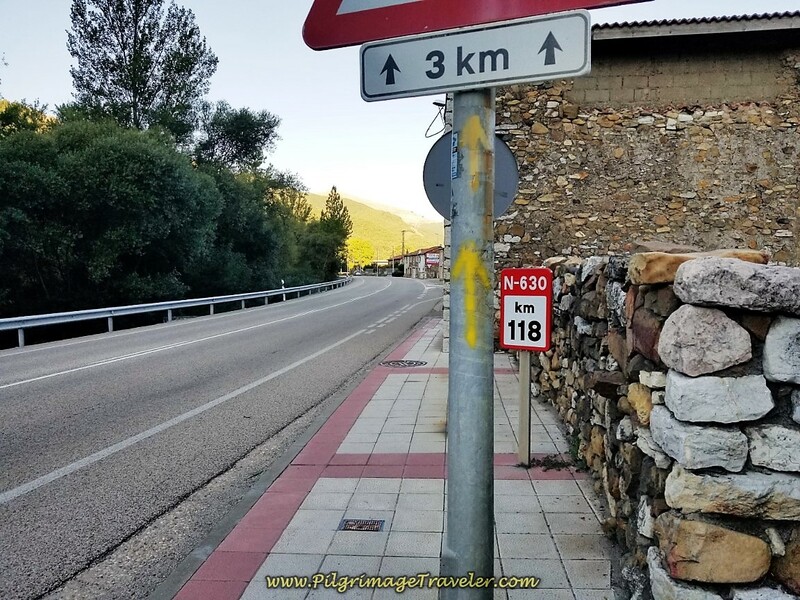 As you can see by this photo in San Martín, the Camino definitely comes through here and does not take a shortcut to avoid town. 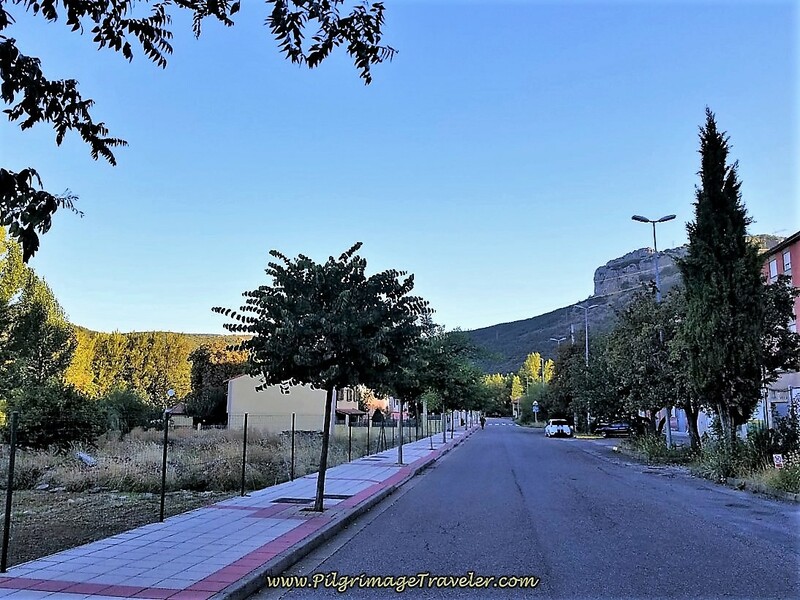 After walking into the heart of town, just before crossing over an arroyo, suddenly, you are directed to turn to the left and walk up a hill on a dirt road, leaving town. This road is shown in the photo below. Something didn't feel right to me! I checked my compass and we were heading in a southwesterly direction! This couldn't be right! I checked Google maps and indeed, we were heading in what appeared to me to be the wrong direction and away from Poladura. So, after walking about 250 meters on this dirt road, we turned around and retraced our steps to town. This is where I turned off my GPS, thinking I was recording an incorrect route. 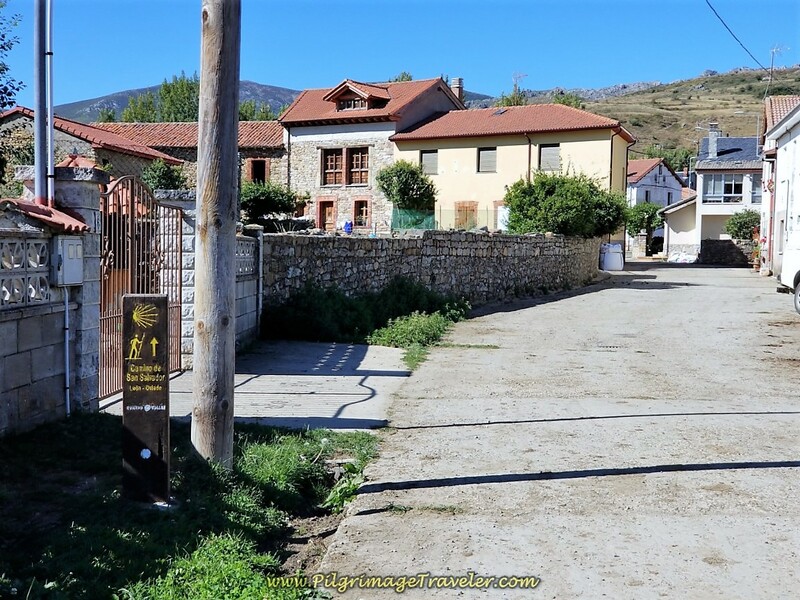 As it turned out, of course, this was the correct route, and if we had walked just another 300 meters or so, the Camino turns to the right by a set of small concrete houses and takes you through the fields, and on a new footbridge into Poladura from the south. 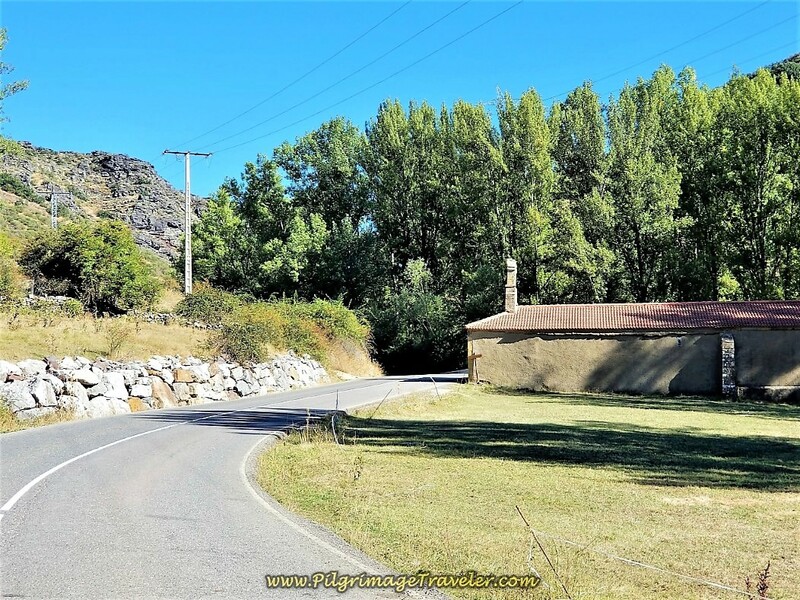 However, since we were staying at the Posada de Embruja, I just followed the paved road from San Martín to the Posada as Google maps directed me. 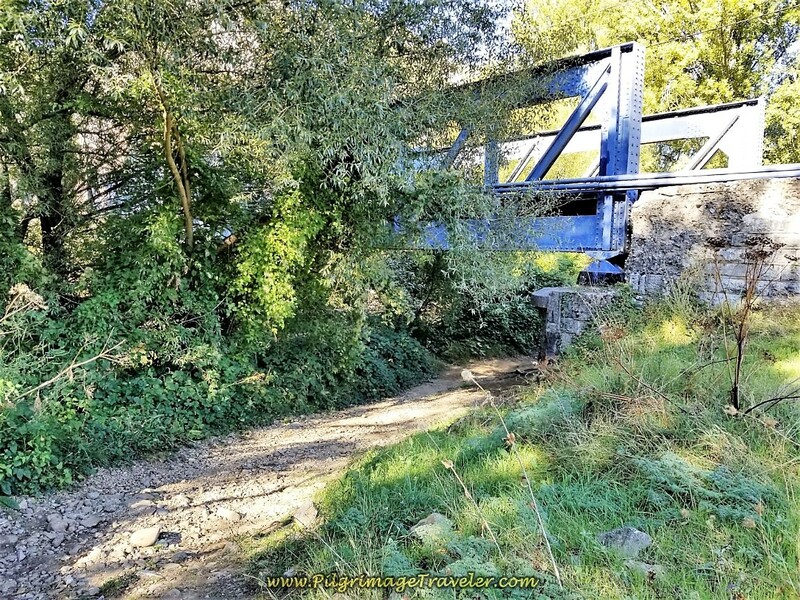 This turns out to be the shorter route from San Martín, just not the official Camino de San Salvador. 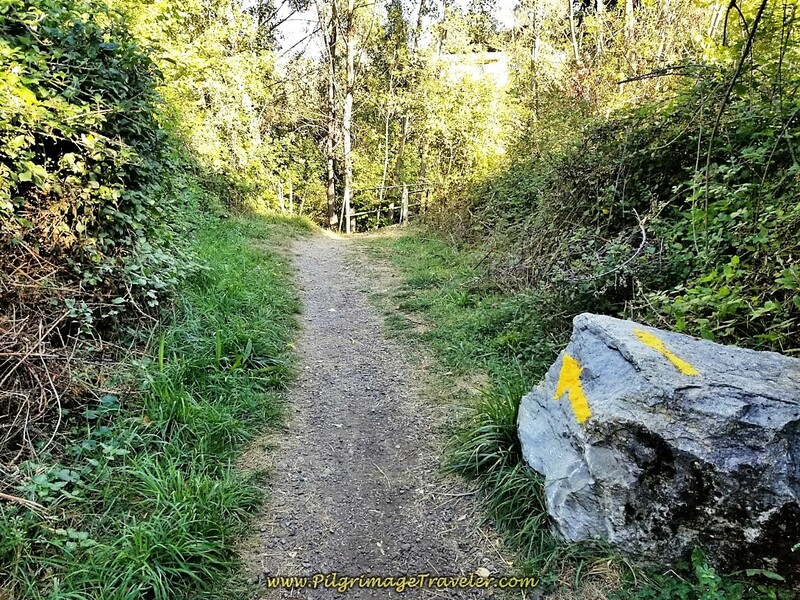 So intuitively, I was right, even though I was wrong in finding the actual Camino. 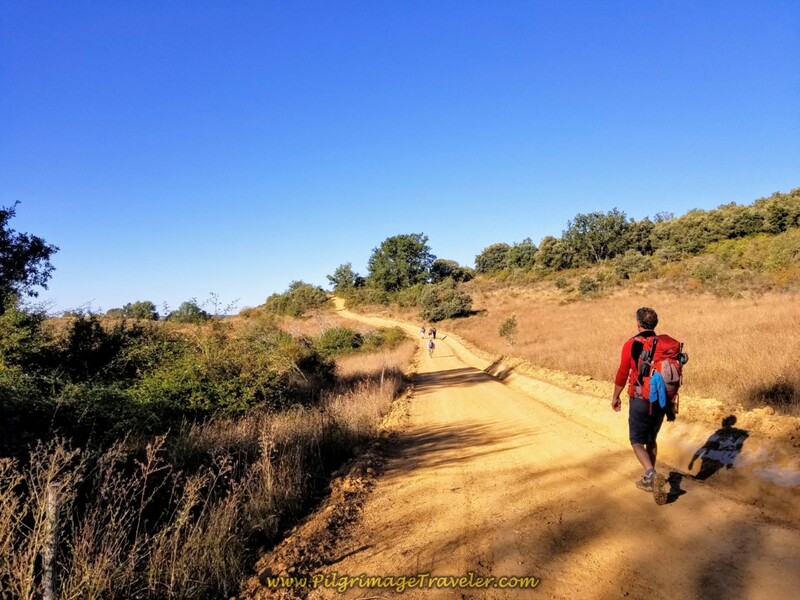 You can see the actual Camino route on our Google map above, which I added later. I guess I just did not want to walk up that hot, open dirt road! Indeed the paved road from San Martín was flat and more shady, so I can't say I regretted taking this way! Here is the sign when you enter the town of about 10 houses! A few meters after entering town, we turned left to see the entrance gate of the Posada El Embrujo. 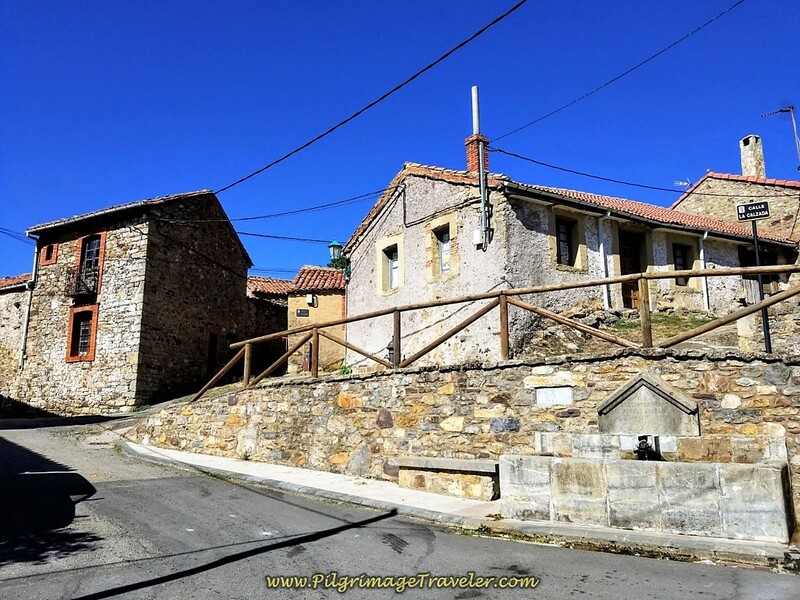 And immediately beside the Posada, on a terrace above, is the Albergue de Peregrinos de Poladura de la Tercia, with 10 place. You can take the stairs up the terrace, or walk up the road to it. 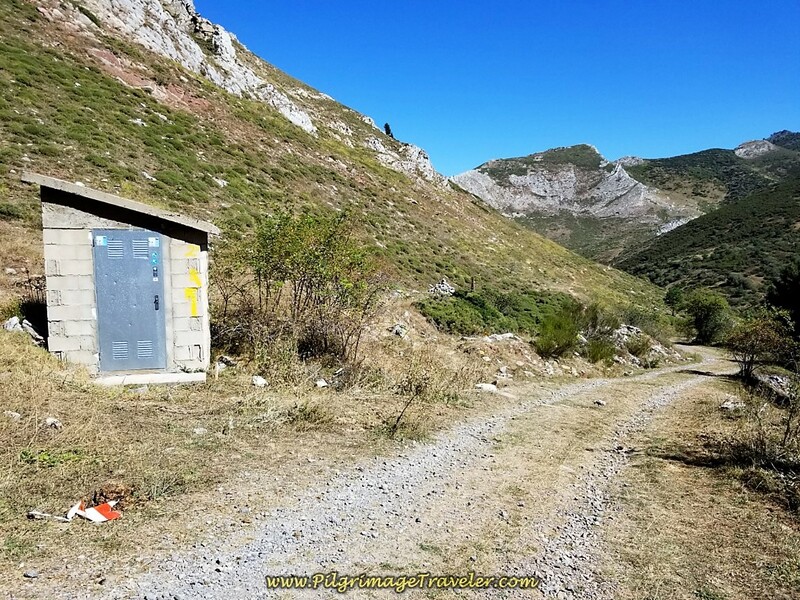 If you are coming in the official way, you will be walking down the hill, and see this view of the albergue in the photo below. There is a kitchen in the albergue, so if you brought your own food, you can cook it here. It has only 10 beds in a shared dormitory. 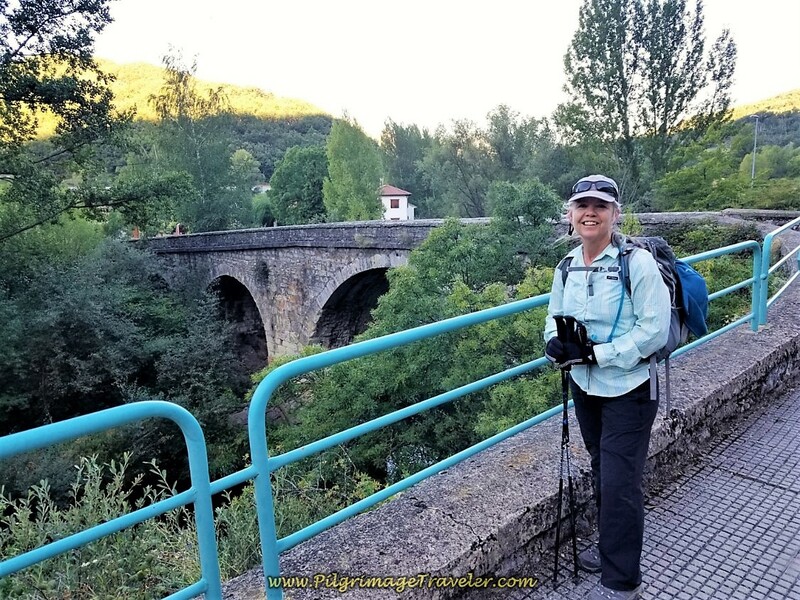 I have no idea why the Camino planners chose to walk you up a hill out of San Martín, then down a hill through the fields to the albergue! It felt like it was only to avoid a few meters on the asphalt. Or perhaps to keep the Peregrino out of private property as I noted above? Or maybe there is more than one way? So be it. Choose your own way! 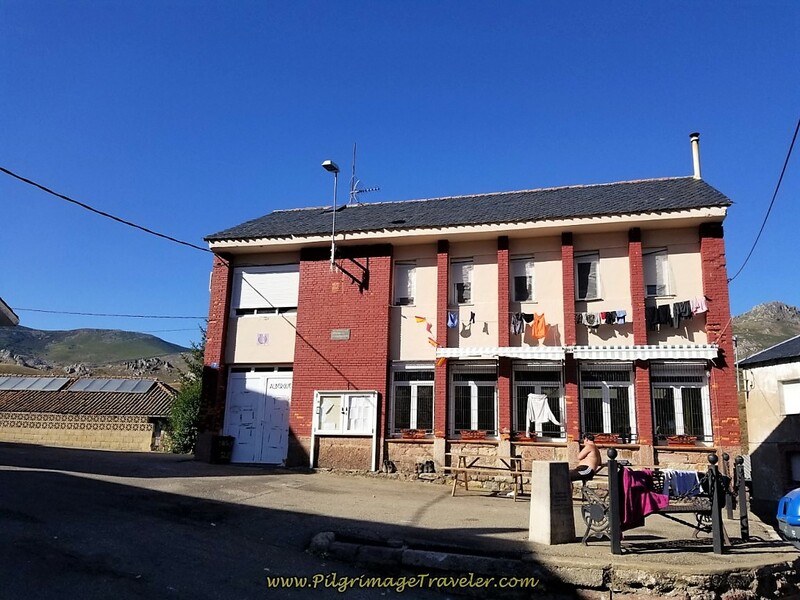 The Posada El Embrujo, which literally means the Inn of the Witches Spell, is a very comfortable bed and breakfast, a real treat in the mountains. However, you will pay a price. It is 42 euros/night for a double room, with breakfast for an additional 3 euros and 15 euros per person for dinner. We did indeed have a lovely dinner, but if you are on a budget, don't choose this place! We were lazy and took the splurge. Our Spanish friends in the albergue ordered dinner at the Posada, but were not allowed to eat in the dining room there! They were required to take it back to the albergue! Don't know if that was because they were not guests. But whatever spell the Posada places on you, the proprietress or employee, whoever she was, wasn't all that friendly, even to us, as guests. I used my best Spanish on her (she speaks no English) and she treated us lukewarm at best. When we ordered wine for our Spanish pilgrim-friends to share with us at happy hour, she seemed to warm up a bit. But not much! I'd like to believe she was only having a bad day. If you stay at the Posada El Embrujo, you must make a reservation, including dinner if you want it. Your only option to stay here, and not have dinner, would be to bring in food that you can eat cold. There is no kitchen of any type that you can use. There is a lovely fountain across the street from the albergue, and all eight or so pilgrims all chatted and soaked our feet and lower legs in the cold water! There was only one English-speaking pilgrim from Australia, who did not join us, because the conversation was essentially in Spanish! My brain hurt when we finally left. Because the day is "short" at 23.6 kilometers, I handled the altitude changes without difficulty. 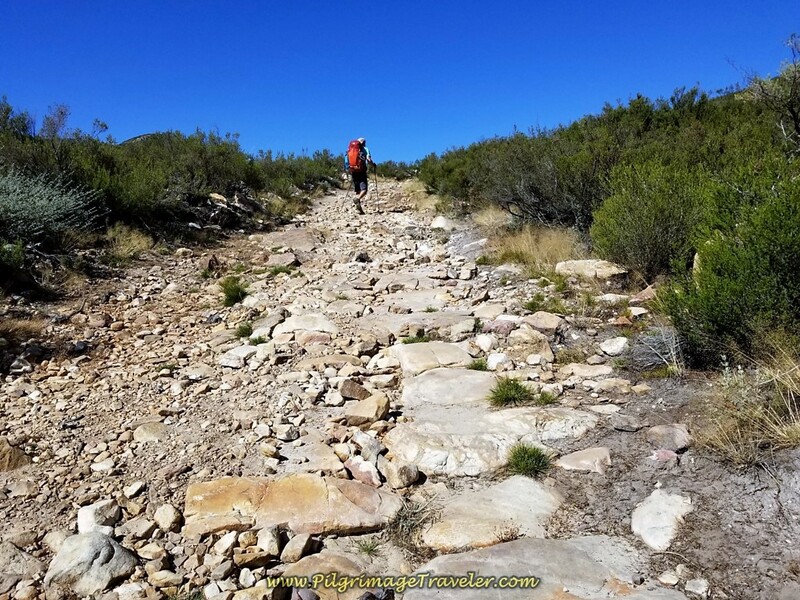 Coming from Colorado, and having many years of climbing under my belt, the 1600 foot elevation change, while I certainly felt it, my heart, lungs and legs were up to the challenge. Many staging systems will have you stop at Buiza but at less than 14k, this just didn't make sense to us. However, as you will see in the next very difficult stage, it may be your best option. Read on, and choose wisely! So far I was at my best game. 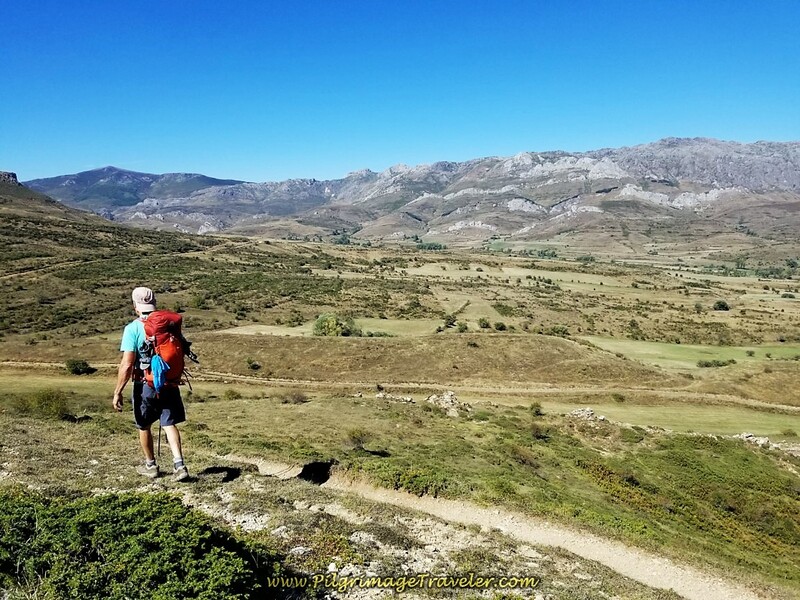 May your own day two on the Camino de San Salvador fulfil your need for adventure and the glory of striving, as the opening quote suggests. To climb this stage to the Alto Forcadas, your sights will most certainly be set far above the merely secure and mediocre! Ultreia!